Click on, Computers: A History, for a PowerPoint presentation. Be sure to click on the links for additional information and photos. Kaypro 4, I rented one of these to type my 265 page master's thesis in 1984. The thesis was stored on five disks. The Kaypro 4 sold for $1,800 at the time, about $3,300 in today's dollars. For that you got 64 kilobytes of RAM, two double-sided disk drives each having a capacitiy of 400 kilobytes, and a 9 inch monochrome monitor. There were no graphics and no modem. It weighed 26 pounds and was the portable computer of the day. Kaypros were made in Solona Beach, California, north of San Diego. I also have an earlier Kaypro 2 which had single sided drives each with a capacity of about 200 kilobytes. Both computers work and I have that library of software and books that were included with Kaypros. While primative by today's standards, the computer was wonderful. If I had to type my thesis perfectly on a typewriter, I would still be typing! Averatec 3225HS,AMD Mobile Athlon XP 2000+ processor, 12.1 XGA TFT LCD Display, 512MB DDR RAM, 40 GB Ultra DMA hard drive, DVD-ROM/CW-RW Combo Drive, Integrated 802.11G wireless, 4.2 pounds, 1 inch thin, price April 2004 after rebates and with printer $700. So far it has been a terrific little computer. The attached 256MB USB thumb drive alone holds the equivalent of 640 Kaypro 4 floppy drives. We've come a long way in only 20 years! Kaypro 4 '84 with Juki 6100 Daisywheel Printer, (1984) The Kaypro 4 '84 was the 1984 version of the Kaypro 4 and offered several improvements including a built in 300 baud modem, a somewhat improved screen with rudimentary graphics (see Graphics on CP/M Kaypros), and a Z-80A processor running at 4Mhz instead of 2.5Mhz with the Z-80 processor. The model names were confusing for the Kaypros. There was a Kaypro IV with Roman numerals, a Kaypro 4 in 1983 like I rented with full height drives, a Kaypro 4 with half height drives and a Kaypro 4 Plus 88 like the one below with an Intel 8088 processor running MS-DOS in addition to the Z-80 processor running CP/M. Kaypro History does an admiral job attempting to sort out the names. The Model 4 computers had double sided drives with about 400 kilobytes per drive. 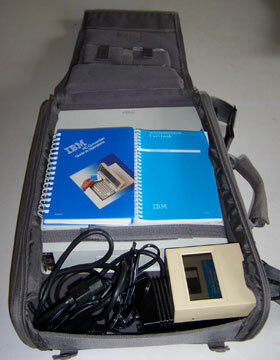 This one came with the Juki 6100 daisywheel printer and was commonly sold as a packaged deal. I recall this combination costing about $2,500, roughly $1,800 for the Kaypro 4 and $700 for the printer. (See Eisenberg, "Writing with a Word Processor" (1983).) Adjusted for inflation this is equal to over $5,000 today. Daisywheel printers produced excellent text, but were very slow (as I recall about 10 or 12 characters per second) and noisy. Things have changed a lot today. As I write this on 3-16-08, I can get a Dell laptop with 1 gigabyte of RAM, a 120 gigabyte hard drive, and a DVD-RW drive, with an all in one printer, copier, scanner, for a total of $500. That laptop has over 15,000 times the RAM and over 150,000 times the secondary storage of a Kaypro 4! The Kaypro 4 basically just showed letters and numbers. Today we can make and watch movies, edit photos, make and view Web sites, listen to and make music, and do countless other things that were impossible on a Kaypro 4. The all in one printer can scan, copy and print with very little noise, very high speed, and very high resolution producing photographic quality prints. All of this has become possible for one tenth the price (adjusted for inflation) in less than 25 years. The computers of the early 1980s were a true revolution compared to a decade earlier. That revolution has continued, however, in the succeeding 25 years. I purchased this Kaypro 4 '84, the printer and all original software and manuals (the Kaypro came with a whole stack of books) for about $40 to $50 at a garage sale on 3-15-08 in the San Carlos area of San Diego less than a mile from my house. The computer is in great cosmetic condition and seems to work perfectly. I was able to create a save a Perfect Writer document with no problem. The printer turns on but I have not yet been able to print a document. I could easily be doing something wrong, however, because you had to remember a lot of key commands with the early machines prior to the introduction of the graphical user interface which came along with the Apple Macintosh 128k, also released in 1984 (see below). Kaypro 4 Plus 88, a Kaypro 4 model with dual processors - a Z80a processor with 64K RAM running the CP/M operating system and an Intel 8088 (hence Kaypro 4 Plus 88) with 256K RAM running MS-DOS. CP/M had been the traditional business operating system for personal computers. IBM choose a small Seattle company, Microsoft, to make the operating system for its new personal computer, the IBM PC (Model 5150). Microsoft was allowed to sell its own version of the operating system, MS-DOS, to other companies. Since the new IBM PC became the defacto standard, companies started to make machines running MS-DOS. The Kaypro 4 Plus 88 allowed users to run either CP/M or MS-DOS. According to Chronology of Personal Computers, in November 1984 Kaypro introduced the Kaypro 16 which was their first MS-DOS only machine. It sold for $3,295 and included a hard drive. I can't find the original price of a Kaypro 4 Plus 88 but I assume it was substantially above the $1,800 of a Kaypro 4. Several sites discuss the Kaypro 4 Plus 88 and other Kaypro computers including: Old Technology Collection, Kaypro 4 Plus 88, Wikipedia - Kaypro, Old-Computers.com, and Old Computer Museum. My Kaypro 4 Plus 88 is paired with a Star Micronics Gemini-15x dot matrix printer. It has a nine wire print head printing at 120 characters per second. The 15x allowed fanfolded paper up to 15.5 inches wide while the similar 10X allowed paper up to 10 inches wide. Generally, a wide carriage dot matrix printer like this would sell for well over $500 in 1983. 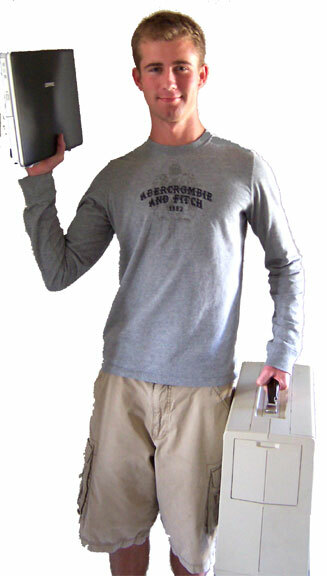 (See Kathy Yakal, "The New, Low-Cost Printers," Compute! Magazine, page 44 (June 1983) at www.atarimagines.com.) (See also Vectronics Apple World (Apple ImageWriter II cost about $600 in 1985.)) Dot matrix printers at the time were fast and could do limited graphics, but did not produce true letter quality results. Daisywheel printers like the Juki 6100 were painfully slow but produced results as good as the best typewriters at the time which were often also a daisywheel design. Both were expensive and often you needed both. When I had to type a thesis in 1984, I started with renting a NEC dot matrix printer (I think it sold for around $500 to $600) and returned it to rent a daisywheel printer for the final printing. My Kaypro 4 Plus 88 also came with a large Epson dot matrix printer. The price for my Kaypro 4 Plus 88 and two printers? Free! I acquired them at a garage sale in the San Carlos area of San Diego on March 8, 2008. It was a large garage sale. The Kaypro and printers were on the curb. I asked if they had been sold. The reply - no, they are free. What a deal! No software or manuals were included. I used the Word Star from the Kaypro 4 '84 above, however, and it worked fine. The Keyboard for my computer has a bad connection. If it is just the connection, it can probably be fixed. I tested the computer out with the keyboard from the Kaypro 4 '88 above. The computer is in fair cosmetic condition. It has some scratches and the keyboard is very dirty. I have not tested the printers. 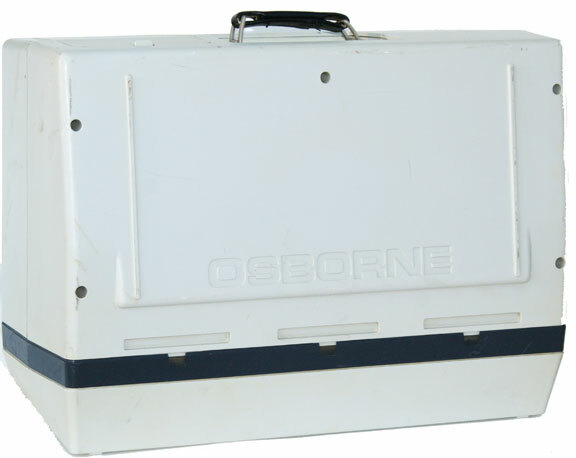 1981 Osborne 1 Large Image, Front Panel, Closed (note how it sits at a slant). 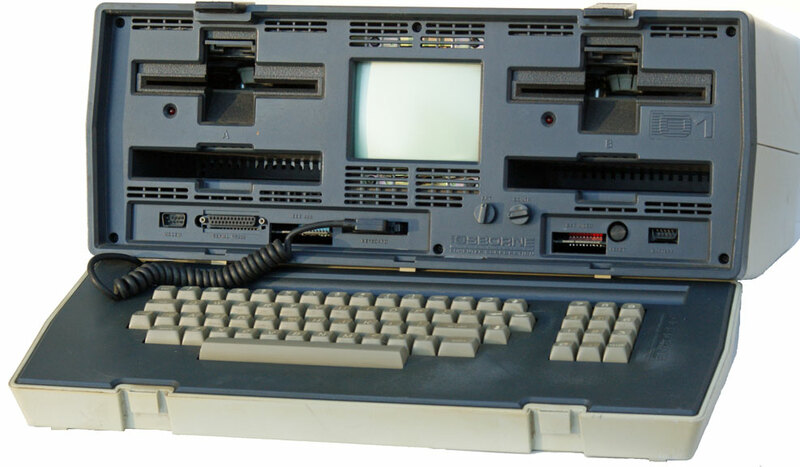 The first truly portable computer introduced April 1981. 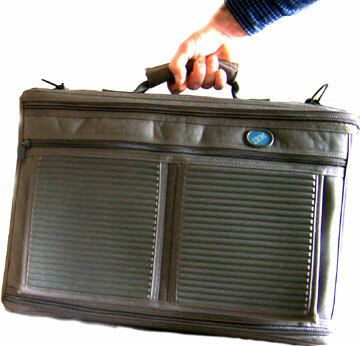 It weighs 24 pounds, can fit under an airline seat and could even use an optional battery. It had a price tag of $1,795 which included the CPM operating system, WordStar word processing, SuperCalc spreadsheet and MBASIC and CBASIC programming languages. That was very affordable for a computer at the time. $1,795 in 1981 equals $4,320 in 2008 dollars. For that $4,320 today you could get ten budget laptops with free Open Office software online. The Osborne 1 has 64K RAM. The two 5.25" floppy drives each store 91 kilobytes of information. To compare, as I write this in July 2008, you can get a 500 gigabyte external hard drive for $95 at amazon.com. That hard drive holds about 5 million times more information that a single Osborne 1 floppy drive! My large photo of the Osborne 1 is about 100 kilobytes, exceeding the capacity of an Osborne 1 drive. That photo itself is 5% its original size out of the camera. 8 gigabyte flash memory cards are common today. Each holds 80,000 times more information than an Osborne 1 drive! Increases in secondary storage in less than 30 years have been astonishing. The Osborne 1 has a 5" black and white CRT display showing 53 x 24 characters of text. The text is actually quite clear, although a 53 character width is frustrating doing word processing since you have to scroll to see a full line of about 80 characters. While its stats are amusing by today's standards, it was very useful in its day and a huge success with sales up to 10,000 per month. (Of course, success is relative. As I write this in July 2008 Apple sold over 1 million 3G iPhones in the first weekend of sales!) My seller bought it new in 1981. He is a power engineer (e.g., works with uninterruptible power supplies). He and his fellow engineers where he worked all decided to go out and each get an Osborne 1. Obviously, to engineers, accountants, and others who do a lot of number crunching, the spreadsheet capabilities at a reasonable cost were wonderful. It was also a great tool for writers, although with a significant limitation of a 53 character wide display. While the Osborne 1 sold well, with increased competition from companies like Kaypro with larger screens and more secondary storage, and the arrival of MS-DOS, Osborne was out of business two years later. I bought my Osborne 1 from an ad on Craigslist on 7-21-08 for $40. 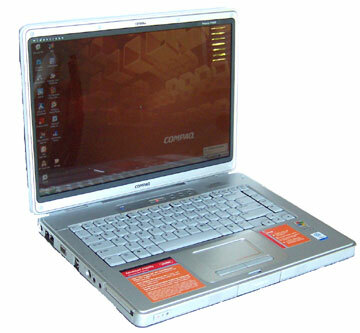 It is in very good cosmetic condition and comes with the software and operating system. It powers on. At first, with the keyboard plugged in the monitor would flicker. It did not do this with the keyboard unplugged, however. Eventually the display was stable with the keyboard plugged in. The drives do not appear to be working, however. The red lights blink for an instant, but the drives never turn. (The original price was $50. The seller agreed to knock $10 off because of the problems.) The Obsolete Computer Website - Oldcomputers.net has a great Web page about the Osborne 1 including internal photographs. 1982 Osborne 01 Large Image, Closed. Described as a minor update to the original Osborne 1, the Osborne 01 had a more rugged white (not beige) case and styling differences. (The Centre for Computing History.) Released 1-1-1982 according to that site. I have two, both acquired for free on Craigslist on 6-26-09. They are in good cosmetic condition with both having yellowed, one much more than the other. They were both very dirty outside, but pretty clean inside. Both are made in USA. The Osborne Company location is listed as Hayward, California. The less yellowed machine is serial no. CA 123808 manufactured 12-27-82. It's pretty cool that inside the door where the plug is there is a tag with punchouts of the exact year, month and day the computer was made. It did not turn on at all. I then noticed the fuse by the plug was missing. I put in the fuse from the other machine. The B drive light briefly comes on and then nothing happens. My guess is someone took the fuse out because the machine was not working. The more yellowed machine has two floppy disks. That computer is serial no. NA 211816 made 10-28-1982. It comes on. It started to try to read one disk, but then I could not get it to do anything else. This machine also has the optional modem that fits into one of the floppy disk storage compartments in the front of the machine. (It appears to be missing the cable from the modem to the front of machine.) Oldcomputers.net describes it as a 300 baud modem that gave "you access to more than 200 electronic bulletin boards across the country (well, in 1982, that is)." Today, Cox High Speed Premier Internet service in San Diego provides download speeds up to 25 Mbps. That's over 80,000 times faster. (25,000,000/300) Upload speeds are 1.5 Mbps, or over 5,000 times faster than 300 baud. The Internet as we know it did not exist in 1982 and the World Wide Web did not exist at all. As of the Summer of 2009 there are perhaps over 200 million Web sites world wide. (See Digital Inspiration.) This machine also has an adapter in the video port in front that allows you to attach an external monitor with an RCA plug - a good idea when the built-in monitor is only 5 inches! IBM PC, Model 5150, introduced August 12, 1981. 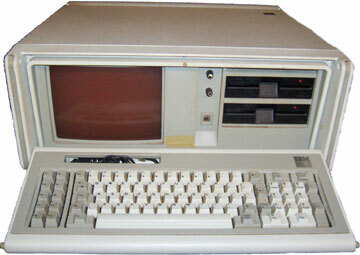 The Model 5150 is one of the most significant personal computers not because it was better than other computers at the time, but because it set the standard for computers to come. IBM was a large, established company that legitimized the personal computer revolution. Click on advertisements for a terrific series of 7 pages of high resolution IBM advertisements. Another ad is at oldcomputers.net. For an excellent description of the Model 5150, including the differences between the rarer version made before April 1983 and the later version, see Greater Pittsburg Vintage Computer Museum Site. (Okay, my site is not as extensive, but be sure to come back here!) IBM also has information on its vintage PCs as well as a fasinating IBM Archives section. The main operating system for the 5150 was from a small software company in Washington State that was better known for its programming languages. As a result of that choice the company, Microsoft, became the giant it is today. Digital Research's better known CP/M operating system was not chosen apparently because its head had concerns over IBM's non-disclosure agreement. It is interesting to note, however, that the Model 5150 could be ordered with CP/M-86 or the UCSD p-System. As an aside, my alma mater, UCSD, had significant involvement in the early development of the PC revolution with the operating system and its version of the Pascal programming language. See UCSD P-SYSTEM MUSEUM. Some of the designers of the original Macintosh had also been affiliated with UCSD. I myself struggled to get through the introductory Pascal programming class in 1979 which I took pass/no pass. The personal computers we used in the class were a recent addition. When I first started at UCSD students used punch cards. The base model 5150 came with only 16 kilobytes of RAM, but could be expanded to 640k using the expansion slots. Each 5 1/4 inch floppy drive held 360 kilobytes of information. My IBM 5150 was purchased for $61.50 in October 2004. It has only 64k of RAM. It is in generally good working and cosmetic condition, except the trim around the monitor is cracked. It has one floppy drive and a hard drive which currently does not work. It is running on PC DOS 2.1. It also boots to Microsoft Basic if DOS is not installed. My computer is apparently the post April 1983 version. As shown, it came with a DOS guide and a BASIC guide. The base model started at $1,600 but this was with no drives or monitor. As I recall in 1983 a decent setup with drives, monitor and printer was about $5,000! 1984 IBM Portable Computer Model 5155, a "luggable suitcase" version of the IBM PC similar in design to a Kaypro or Osborne, and apparently designed to compete with the Compaq Portable discussed below. It was introduced in February 1984 at a price of $4225. The motherboard is the same as the IBM PC. Mine has 512k of RAM and two 360k floppy drives. It is in good working and cosmetic condition, but was very dirty (see keyboard photo)! It was purchsed on Ebay in November 2004 for $41.23 with $16.95 for shipping. For more information including the original IBM announcement, see oldcomputers.net. IBM System/36 PC. 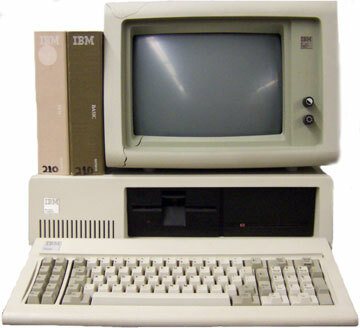 The IBM System/36 was introduced in May 1983. 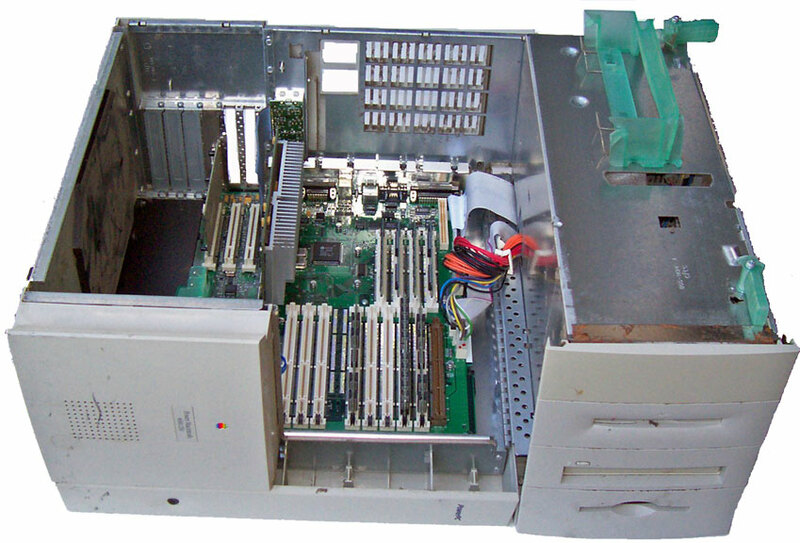 The base system consisted of a System/36 PC connected to an IBM PC 5150. (Back view. )The System/36 PC had 128k RAM and a 30mb hard drive. A 1986 advertisement in Byte Magazine shows the set-up. A 1985 ad states that the IBM System/36 PC has a starting price of $5,995. Besides the System/36 PC (Model 5364), there was also a mid sized unit maybe three times larger than the PC (Model 5362 - 1 MB RAM, 120 MB hard drive) and a large unit perhaps the size of an office desk (Model 5360 - 1.75MB RAM, 800MB hard drive). A base system with two displays and a printer cost $34,000. (See http://www-03.ibm.com/ibm/history/reference/glossary_3.html) My IBM System/36 PC with IBM PC Model 5150 was purchased on E-bay in November 2004 for $25. It was used by an insurance agent in the Los Angeles area from 1986 to 2004. The original cost was $14,000, over $24,000 in today's dollars. Side view compared with 2004 Averatec. 1986 IBM Convertible PC 5140, IBM's first laptop and IBM's first PC to use 3.5 inch floppy drives. Accessories, including a printer, CRT display adapter and serial or parallel adapter, could be hooked up to the back. 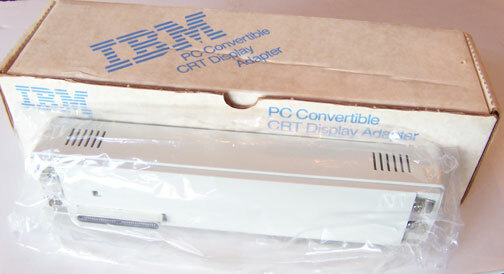 The CRT display adapter allows use of a color or monochrome IBM monitor, or to a television through the RCA port. 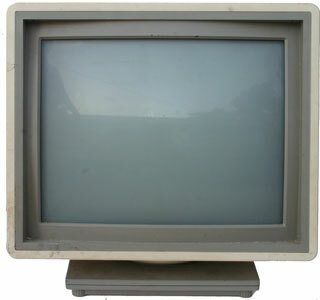 The LCD screen could be detached for use with a CRT monitor. The 5140 has a CMOS 80C88 4.77 MHZ microprocessor, with 512K CMOS Static RAM (base RAM was 256K), and two 720k 3.5 inch floppy drives. Three LCD displays were offered: (1) the difficult to read standard display, (2) a Super Twisted LCD display, with better contrast, and (3) a Super Twisted LCD display with a fluorescent backlight. My computer has the backlight display and is very readable. The computer is very solid and has an excellent keyboard. Despite several desirable features, the PC Convertible never sold well and was generally out-classed by other laptops such as Toshiba. My 5140 was purchased on eBay February 6, 2005 and is in excellent working condition. It comes with a nice case. (case opened, case closed) My computer was $40 with $20 shipping, plus sales tax. I obtained manuals ($8 plus $3.85 shipping) and a new, unopened CRT adapater ($2.25 plus $8.80 shipping) in separate eBay auctions. The only problem with my computer is some minor rub marks on the top. I was amazed by the 5140 looking at a brochure from the UCSD bookstore in 1986. I had just started working in San Diego, however, and the $2,000 price tag was much too extravagant for me. An excellent, detailed discussion of the 5140 is in the 8th edition of Repairing and Upgrading PCs, by Scott Mueller (QUE). Also good is oldcomputers.net. MicroVAX II introduced May 1985. Sandwiched in between mainframe computers and PCs are mini-computers. "Mini" is relative. These were generally desk size or larger, not desktop. When PCs arrived PCs were described as "micro" computers to distinguish them from mini computers. Perhaps the company most closely associated with minicomputers was Digital Equipment Company or DEC, founded in 1957. DEC was successful for over three decades in marketing minicomputers to businesses and universities. Now individual departments within universities and businesses could have a computer and avoid, or at least lessen, sharing time on a mainframe computer. Mini computers were still much too big and expensive for individuals, however. The grandfather of an OLG family generously donated in September 2006 this DEC MicroVAX II, one of the later and smaller minicomputers. 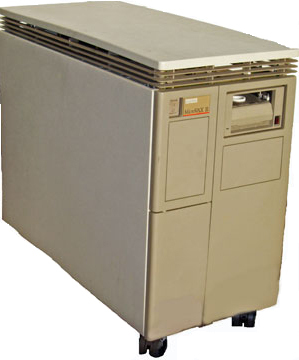 The MicroVAX II was DEC's first 32 bit machine and sported 1mb of on board memory expandable to 16mb. (HP.com and HP MicroVAX II. See also Microsoft Research, trailingedge.) Its dimensions are about 24" high by 13" wide by 28" deep- a very small minicomputer or a huge PC tower. The 160 page manual is available at bitsavers. 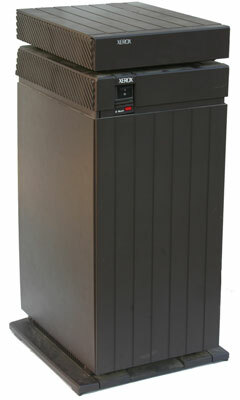 The price new for a base model MicroVAC II was $20,000 according to Webmythology and Falling Cost of Computers. The "Falling Cost of Computers" article also compares the speed of the MicroVAC II with numerous other computers before and after the MicroVAX II. My MicroVAX II came with a CIT-101 monitor which is described in williambader.com as a DEC VT-100 clone. In addition to the MicroVAX II, I received some other great computer artifacts and took photos of computers and peripherals that were too big to take. Please see Additional DEC Related Items for more photos and descriptions coming soon! Xerox 6085 (1985) Produced from 1985 to 1989, the Xerox 6085 was the culmination of Xerox innovation in graphical user interfaces, networking and object oriented programming at their famous Palo Alto Research Center or PARC. The roots of the Xerox 6085 go back to the Xerox Alto (as in "Palo Alto") produced at PARC in 1973. It was not a desk top machine. Rather, the Alto was about as about as tall and deep as a desk and half as wide as can be seen in the photo in the informative September 1981 Byte Magazine article. (See also DigiBarn Computer Museum: The Xerox Alto.) The monitor, keyboard and three button mouse sat on the desktop, however. Designed for one user at their desk, it had the foundations of the modern personal computer. However, given its size and cost of about $32,000 (in excess of $150,000 in 2008 dollars), it was not yet considered a "personal computer." Indeed, it was never really a commercial product. Rather, Xerox made it for research purposes, although it was widely used within PARC and many were donated to universities. It came with two 3 megabyte hard drives with 64 kilobytes of RAM expandable to 256 kilobytes of RAM. The monitor was in "portrait" as opposed to "landscape" mode. The machine was truly revolutionary when you consider its graphical user interface was more than a decade before the Apple Lisa and Macintosh. Further, each machine was made to be easily networked with other computers. While the Alto was not commercially produced, its ideas were incorporated in the Xerox Star system introduced in 1981. The Star cost about $16,000 per machine, but was usually networked with other machines and a file server. (Wikipedia - Xerox Star.) It was therefore quite expensive. In addition to its cost, the hardware at the time often had trouble keeping pace with the software. This therefore could lead to mediocre performance. Therefore, while innovative, the Star was not a large commercial success. The successor to the Xerox Star was the Xerox 6085. It was the last model in the Alto, Star, 6085 trilogy. It was a large tower about 21 inches high, 14 inches deep and 9.5 inches wide - more comfortable under a desk instead of on top of a desk. The floppy drive which fits perfectly on top of the tower adds another 2.5 inches to the height. Mine comes with a 19 inch monochrome monitor, itself very large with a face of approximately 19 inches by 19 inches and extending about 16 inches deep. Toastytech.com has a nice photo with an Alto, Star and 6085 showing the size comparisons among the three. RAM was 1.1 mb expandable to 3.7 mb. It had an 80 mb hard drive. The operating system and graphical user interface was called Viewpoint and was written in a language called Mesa. The Xerox 6085 also could run MS-DOS. (See oldcomputers.com.) It sold for around $15,000 in 1986, or about $30,000 in 2008 dollars. (See DigiBarn Computer Museum.) This was much more expensive than a typical PC at the time, but the Xerox 6085 was also very advanced at the time. It had a two button optical mouse - years before most optical mice. The mouse also plugs into the keyboard like in later Apple computers. Tens of thousands were sold, but it was still not a huge commercial success since lower priced PCs dominated the market. Guidebookgallery.org has a two page Xerox ad for the 6085. I acquired my Xerox 6085 for free from an ad on Craigslist on 10-12-08. The seller lived in the Sorrento Valley area of San Diego. He worked in computer networking and was moving. It sounded like he had the machine for about ten years. It comes with several manuals and disks. He indicated it is working. I still need to try it out. It is in good cosmetic condition. It is a very interesting and historical addition to the museum. 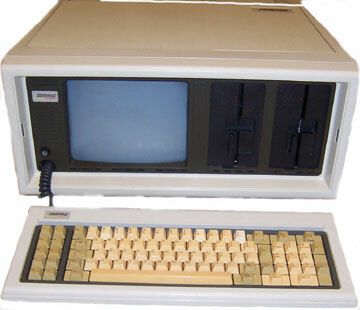 Compaq Portable, the first Compaq, and the first 100% IBM Compatible, initially sold in March 1983. Compaq was formed by two former Texas Instruments employees. (Compaq in 1998 acquired Digital Equipment Corporation (DEC) for $9.6 billion. 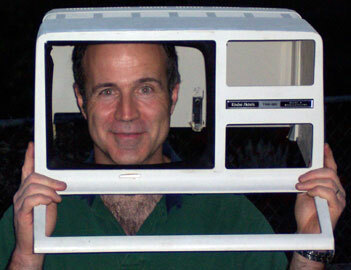 DEC developed the first minicomputer. See Wikipedia DEC article. Compaq later mergered with HP as described below.) 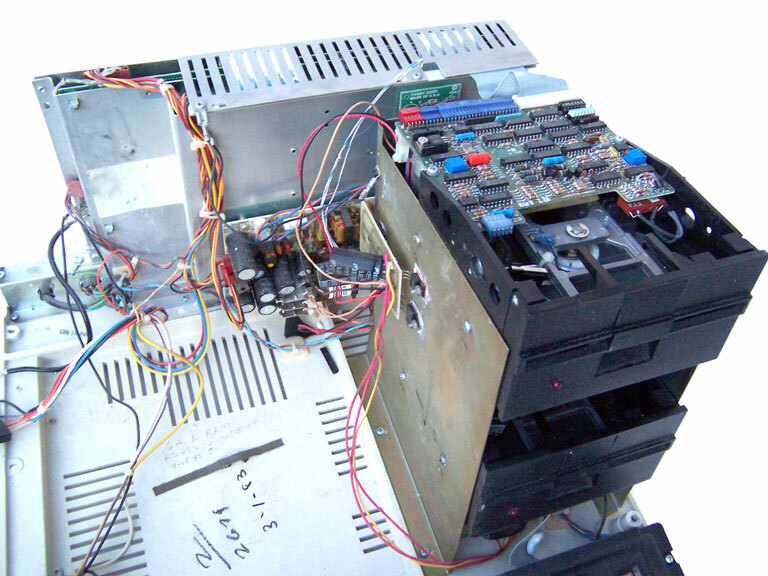 Compaq was able to develop a ROM BIOS that duplicated all of the functions of the IBM BIOS. This allowed the Compaq to run all programs that could run on the IBM PC. 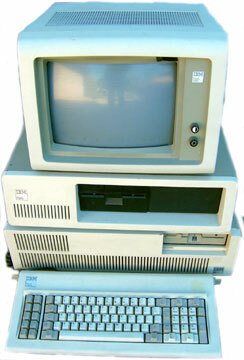 IBM compatibles by Compaq and other manufacturers such as Dell eventually dominated over IBM PCs as a result. My computer was purchased on Ebay for $26 with $14.95 for shipping. It is in good operating condition except some keys fail as a result of deterioration of the foam layer under the keys. (Interior of keyboard.) I fixed this on some keys by putting a small piece of sponge under the keys. The Compaq Portable came with two 320k drives and 128k RAM expandable to 640k. As shown in an ad in the Attached, Marcin Wichary Web Site, the Compaq was promoted for its transporability, yet weighed 28 pounds. Compaq Armada 7792DMT Laptop (Large Image) (1998) Pentium II processor. Original new cost with docking station was $6,198. The docking station was $863. A photo with the docking station is at Andover Consulting Group. I do not have the docking station. The date and prices are from PC World. Specifications are at baber.com. Monitor: 13.3" color TFT Max Resolution 1024 x 768 with up to 64 K colors. RAM is 64 megabytes expandable to 144 megabytes. Mine has 80 megabytes. Standard hard drive was 5 gigabytes, although mine has only a 2 gigabyte hard drive. The price depreciates greatly in 11 years. I bought mine for $2 at a La Mesa, CA garage sale on 4-4-09. It is in good working and cosmetic condition. The power supply is built in - in other words, not attached to the cord. The battery charging light on the computer does not come on. Nevertheless, it did boot up on battery power alone after several hours of charging. It seemed to struggle doing this, however, so I doubt the battery has much life. The computer is running Windows 98 Second edition. The original operating system was Windows 98. Unfortunately, you need the docking station for a network port. Therefore, I can't hook it up to my cable Internet. 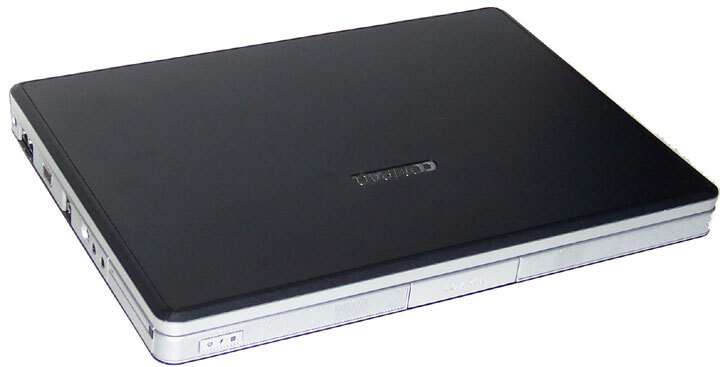 2005 Compaq Laptop, Compaq Presario V4005CL, Intel Celeron M Processor 350 (1.3 GHz), 512MB DDR RAM, 80GB hard drive, 15.4" WXGA High Definition BrightView Widescreen Display, DVD+/-RW and CD-RW Combo Drive with Double Layer Support (burns double layer DVDs), internal wireless 802.11g/b. Purchased in May 2005, this was a 18th birthday present, high graduation and college admission present to my older son. I get the computer back for the museum after the end of its practical useful life. This laptop is larger than my Averatec since it has a larger screen (15.4" vs. 12") which is great for watching movies. It has 4,000 times the RAM and 125,000 times the secondary storage, and is less than 1/4 the weight and less than 1/4 the cost (1/8 in constant dollars) compared to the 1983 Compaq Portable. 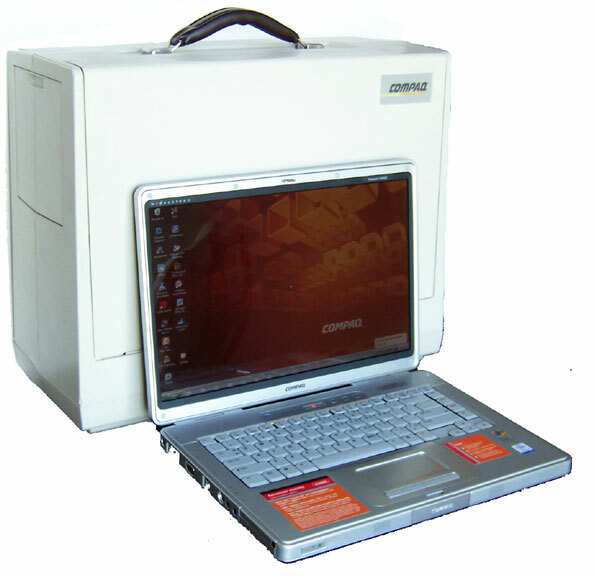 The volume of laptop is less than 10% of the volume of the 1983 Compaq Portable. (Laptop about 1.5" x 10.5" x 14" equals 220.5 cubic inches. 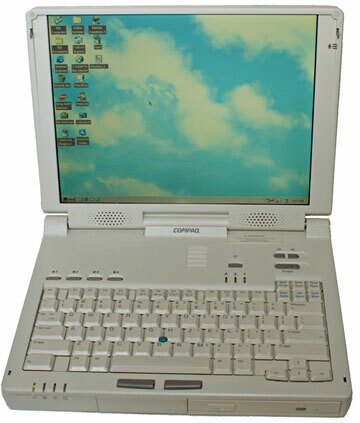 Compaq Portable about 16" x 19.5" x 8.5" equals 2,652 cubic inches.) The laptop has almost 3 times the screen area. (Laptop screen area about 13" x 8" = 104 square inches. Compaq Portable screen area about 7" x 5.25" = 36.35 square inches.) Of course, with the new laptop you can do things like edit photos and make movies, things not possible with the Compaq with a monochrome monitor and no or limited graphics. Photos - Next to Compaq Portable, son holding up both computers, Compaq laptop closed. Hewlett Packard 95 LX. Hewlett Packard was founded by Bill Hewlett and Dave Packard in 1939. HP is noted for for many electronic products including calculators, computers, printers and digital imaging products. Their first product was an audio oscillator built by Hewlett and Packard in a Palo Alto garage, not unlike Jobs and Wozniak of Apple close to 40 years later. Wozniak indeed worked for HP. HP merged with Compaq on May 3, 2002. The HP site has an interesting history about the company. 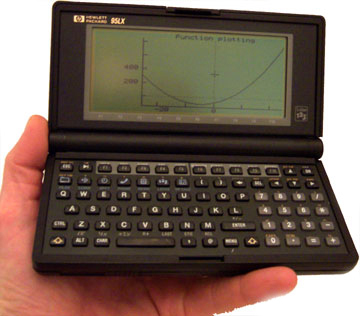 The HP 95LX palmtop PC, introduced in 1991, was HP's first palmtop personal computer. (That same year HP also introduced the DeskJet 500C printer, which signaled the start of affordable color ink jet printing.) The 95LX is about the size of a large pocket calculator, but is a general purpose computer with the same processor (8088) as the original IBM 5150 PC! The 95LX has several programs built into it including Lotus 123, a calculator with advanced business and scientific functions including graphing capabilities, a text editor, a calendar and an address book. The 95LX has a NEC V20 H (8088) processor running at 4.77 MHz with 1mb ROM, and 512kb RAM (some have 1mb RAM). The operating system is MSDOS 3.22. The 95LX takes PCMCIA Type I RAM cards for secondary storage. Many technical types still use the HP 95LX or later 100LX or 200LX. Some excellent sites include: Daniel Hertrich Technical Information, HP Museum (includes virtual tour and multiple view), RS Programmable Calculators, Palmtop Paper, Palmtop Cafe, and Dr. Reddy (a Michigan State University pediatrician with bioengineering and electrical engineering degrees in addition to the M.D.! He also has a Kids Fun Sites page.). My 95LX was purchased on eBay January 21, 2005 for $7.50 plus $7.95 shipping from the Medical Department of Wright State University in Ohio. It is in excellent working condition and came with two manuals. Hewlett Packard Pavilion 8668C, purchased new in May 2000 at Sam's Club for $1,550. This HP has a Pentium III processor running at 650 mHz with a 100 mHz front side bus. It originally had 128k RAM, later upgraded to the maximum of 256k RAM. It runs Windows 98 second edition. It has floppy, CD-RW and DVD drives. It originally had a 30 gb hard drive which failed in late 2003 and was replaced with an 80 gb hard drive. It originally had a 17 inch CRT monitor which failed and was replaced by a Sylvania 15 inch LCD monitor purchased for $350. A separate video card was also installed. The computer still works but is very sluggish by today's standards. Only five years later you can get a much better computer for $350 with a CRT monitor or $450 with an LCD monitor. 1992 Dell Precision 386SX/25. Dell was started by Michael Dell (born 1965) while a student at the University of Texas in 1984. Dell became an industry leader selling quality computers on the Internet at very competitive prices. The Dell Precision 386SX/25 used the less expensive SX version of Intel's third generation processor, the Intel 386. 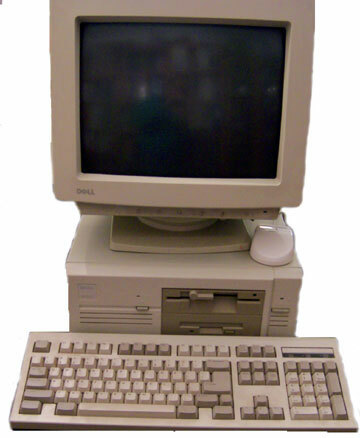 The Dell Precision 386SX/25 came with MSDOS 6 and Windows 3.0, 2 mb of RAM expandable to 16mb, a 25 mhz processor, 1.2mb 5.25" and 1.4mb 3.5" floppy drives, and an 85mb hard drive. I purchased this from Costco in 1992 for $1,295. It remains in good working condition. 2004 Dell Dimension 4600, purchased on the Internet in March 2004 for $800 which includes tax and shipping. 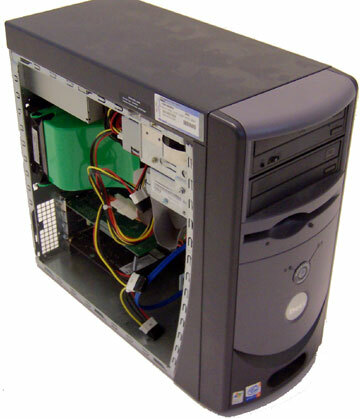 This Dimension 4600 has Windows XP Home Edition, a 3ghz Intel Pentium 4 processor with Hyper-Threading technology, a 120gb hard drive, a DVD ROM drive, a CD/DVD RW drive, a 1.4mb floppy drive, 8 high speed USB 2.0 ports, and separate video and sound cards. It originally had 256mb of RAM (PC2700 DDR333). I upgraded the RAM to 1gb (PC3200 DDR400) for about $120 after rebates. I also added a firewire card. The computer came with a 15 inch flat panel monitor. Pretty amazing statistics compared to a Kaypro 4 only twenty years earlier or a Dell 386SX only 12 years earlier! 1998 Toshiba Libretto 100CT (Large Image) released 2-3-1998 according to Adorable Toshiba Libretto. That site indicates the dimensions are 210mm x 115mm x 34mm. That's about 8.25" x 5.25", a little less than a piece of letter sized paper folded in half, and 1-3/8" thick. Mass is 950g or a weight of about 2.1 lbs. The screen is 7.1" diagonally measured. That is all very small for a general purpose computer with a standard operating system. Most "netbooks" in early 2010 as I write this with 10.1" displays are a little more than 10" x 7" x 1" and weigh about 3 lbs. Those netbooks, however, boost a keyboard that is actually just big enough for comfortable touch typing, while the Libertto is difficult to use for touch typing. 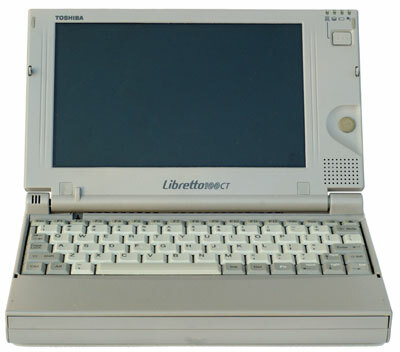 Additionally, the Libertto 100CT cost about $1,400 with accessories such as a dock, external floppy drive and external CD drive often bringing the price to over $2,000. (Tim Pozar, Linux and the Toshiba Libretto 100CT.) Further, while inflation has been relatively calm between 1998 and 2010, $1,400 in 1998 has the equivalent buying power of about $1,860 in 2010. 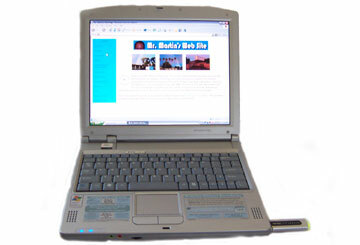 In constrast, a 10.1" display netbook in 2010 costs about $300 give or take, with a total cost of about $400 give or take if you throw in an external RW DVD drive. Nevertheless, the Liberetto 100CT was a pretty amazing little machine at the time and twelve years later is still quite usable. They originally came with a 2.1GB hard drive, but mine has apparently been upgraded to a 14.0GB hard drive! Mine is running Microsoft Windows 98, Second Edition. It has an Intel Pentium Processor. It has 64MB of RAM, which is the maximum possible. They originally came with 32MB of RAM. Mine also comes with a EtherLink II LAN PC Card, a D-Link Air IEEE 802.11b Wireless LAN Adapter, and a 3Com Megahertz 56K WinModem PC Card. 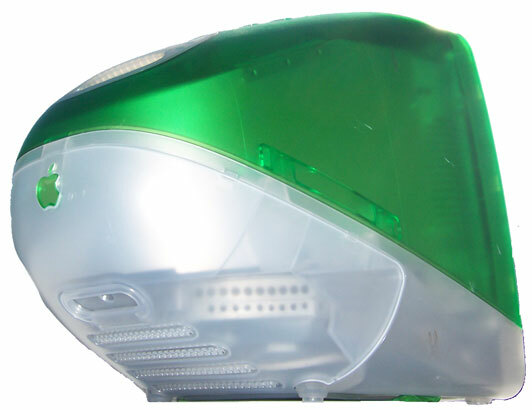 Each of these can fit into the PCMCIA slot into the computer and give access to wired, wireless or dial-up network connections. I also have an external floppy drive and an external CD drive. I acquirred mine at La Mesa, CA garage sale with several accessories and another model Libertto. I don't recall the exact price, but I think everything was less than $60. I recall trading one model for another with a gentleman who got my number from the garage sale. He was using his to do automotive diagnostic work. < width=375 height=324 alt="[1984 Macintosh 128k]">1984 Macintosh 128k, the first commercially successful computer with a graphical user interface, making this computer truly revolutionary. 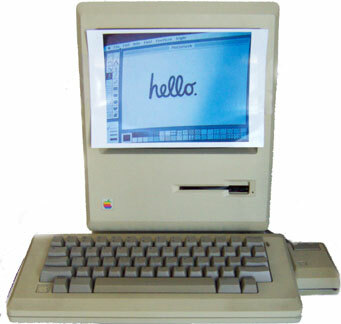 Apple previously introduced Lisa with a graphical user interface, but Lisa sold for about $10,000 making it beyond the reach of most people. The Mac 128k was introduced in January 1984 with much fanfare and a Super Bowl ad. It sold for about $2,500. The computer was upgraded later to the Mac 512k, many finding the original 128 kilobytes of memory inadequate. The computer is quite portable. The monitor is monochrome. Macintosh 128k, the computer which in Apple ads said "hello." My Mac 128k was purchased on E-bay in November 2002. It is in good condition with the original software. The computer has one 400 kilobyte internal floppy drive. I also have the model M0130 external drive, but it does not work. I also have a beat up, non-working 512k Mac with the internal drive removed which I may someday make into a Mac aquarium. (Mac aquariums are apparently all the rage!) See The Apple Collection for a sampling. 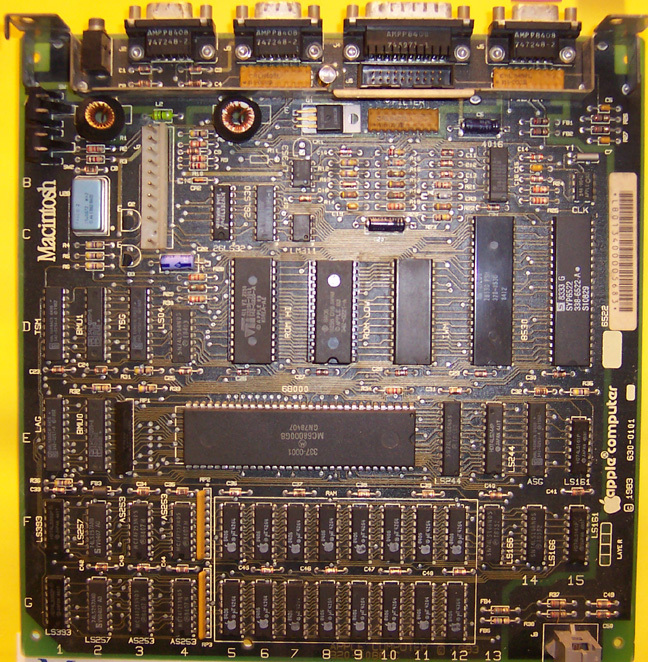 Click for image of the 512 motherboard. For detailed information about the original Mac see Low End Mac and the links there. Macintosh SE FDHD, the Macintosh SE was introduced March 2, 1987 at the same time as the Macintosh II. 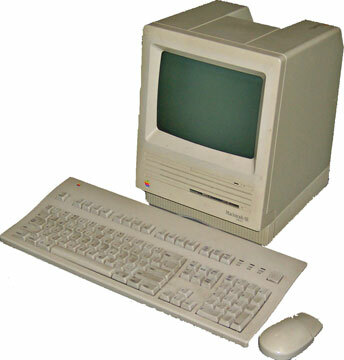 Unlike the Macintosh II, the SE maintained the basic all in one design of the original Mac. It came with either a drive and either a 20 or 40mb hard drive or a second floppy drive. The later SE FDHD model that I have was introduced in August 1989 and used high density 1.4mb floppy disks. RAM was 1mb expandable to 4mb. Mine was purchased in the Spring of 2006 at a garage sale in the Fletcher Hills area of El Cajon, CA for $25 from its original owner, a graphic designer who was very knowledgeable about the computer and included numerous applications, cables and storage devices. It is in excellent cosmetic and working condition. The original price was $2,900 for the dual floppy model or $3,700 for the 20mb hard drive model. (The $800+ for a hard drive works out to $40 per megabyte. Today hard drives sell for less than $0.50 per gigabyte! That's over 80,000 times more bang for your buck in less than 20 years!) Several sites have excellent information: Wikipedia, Low End Mac, Old Computers.com, Apple History.com, and Mac512.com. Macintosh IIci, (large photo) (9-20-89 to 2-10-93) Dates from Low End Mac which states the price at introduction as $6,700 or $8,000 with a 40MB hard drive (about $11,550 or $13,900 in 2009 dollars)! 25MHz, 1MB RAM expandable to 128MB, System 6.0.4 to 7.6.1. I acquired two for free from a young man who had collected many 1990s era computers and was now getting rid of them. It has a sticker on it indicating it originally came from the University of Illinois. In decent cosmetic condition. I still need to try it out. Macintosh IIfx, (large photo of entire computer) (1990-1992) Described as "wicked fast," the Mac IIfx was the most expensive Macintosh ever with a price tag of about $10,000 or more depending on configuration. That also puts it on the same price level as the original Lisa. It had a 40mHz processor and 4mb of RAM expandable to 128mb of RAM. The processor speed and the RAM were both very impressive when the IIfx was introduced on March 19, 1990. It was discontinued on 4-15-92. 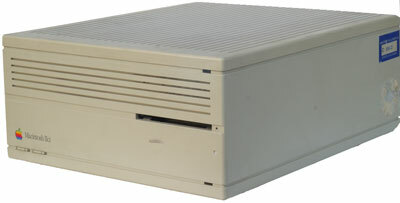 While impressive internally, the case is the same rectangular box as the Macintosh II and is similar to most desktop computers at the time. While not as eloquent as current Macs, I like that basic design compared to a tower since you can set your monitor on top for a convenient viewing height and the case is easy to open and work on. The IIfx was a gift to the museum in September 2006 from the same OLG family that donated the DEC MicroVaxII computer. The IIfx is in good cosmetic and operating condition. Detailed information is at several sites: Low End Mac, Wikipedia, apple-history and Macintosh II series. Power Macintosh G3 Beige Mini Tower, introduced November 1997, terminated 1999. 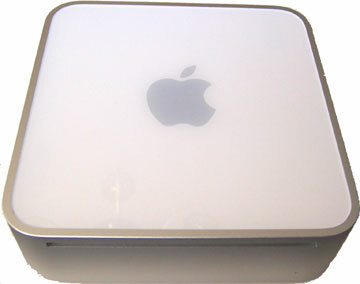 The beige Power Mac G3 came in a minitower version (here), a desktop version (below) and an all in one version with built in monitor sold to educational markets only. 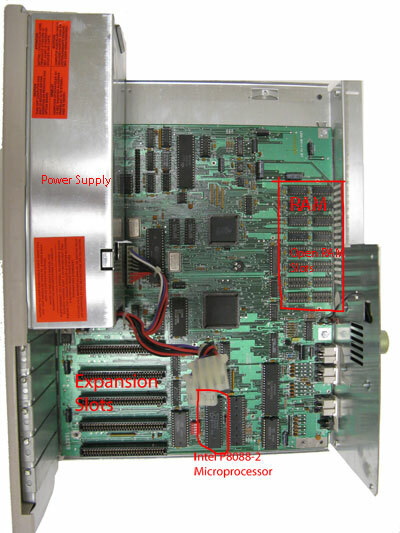 (Power Macintosh G3 Wikipedia.) 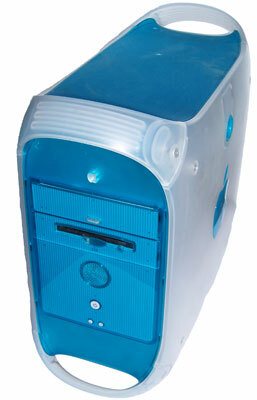 The beige Power Mac G3 was followed by a blue tower Power Mac G3. 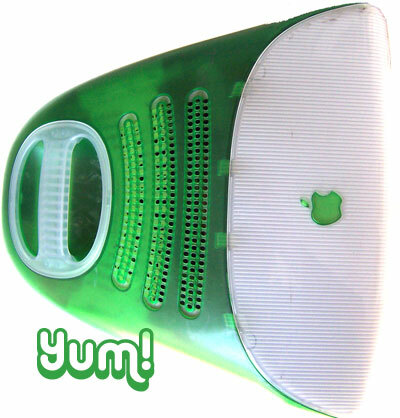 By August 1998 Apple also begin shipping the stylish iMac (iMac Wikipedia) all in one with colored translucent panels and also using a G3 processor. A complete listing of Apple models over the years is at apple-history.com. This G3 is running OS 8.6 with a 250MHZ processor, 96mb of RAM, a 2GB hard drive, a CD-ROM drive, a floppy drive and a 100mb Zip drive. It was a generous donation to the museum from Stella Maris Academy on 11-08-06. It is in good operating condition. Everymac.com lists the new price as $2,400. In addition to listing the specifications, Everymac.com has a video showing the easy open case which explains the odd protrusion of the case on one side. See Interior View. This computer has a firewire port, two USB ports added with an expansion card, and audio and video in and out ports (RCA and I believe SVHS). 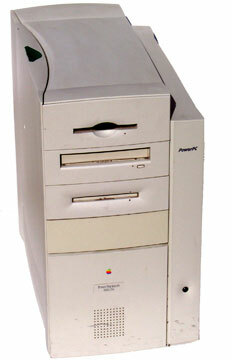 Power Macintosh G3 Beige Desktop, introduced November 1997, terminated 1999. This desktop version of the G3 was purchased at a San Carlos (San Diego) garage sale for $10 on February 25, 2006. It is in near new cosmetic and operating condition. It is running OS 8.5 and comes with Microsoft Office 1998, as well as Mavis Beacon Typing, Print Shop, Smart Sketch, Home Gormet and all original manuals and disks. It has a 3.5 inch floppy drive and a built-in Zip drive (100mb). It has 64mb of memory and a 6 GB hard drive. It would actually be quite usable today for word processing and surfing the Internet. It appears to have two firewire ports, but was just prior to the advent of USB ports on Macs. 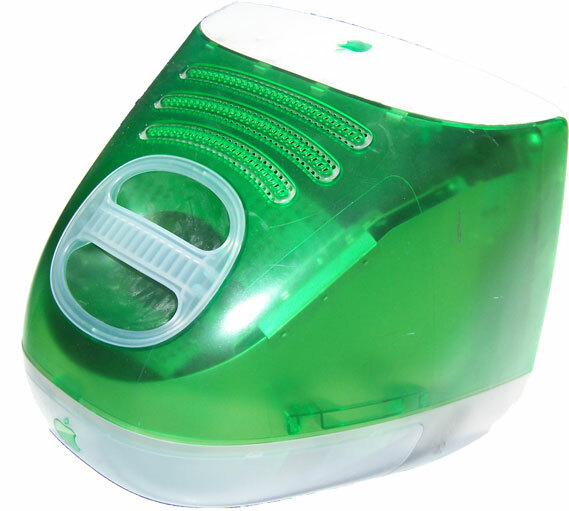 iMac, (circa 1999). Excellent information is at apple-history.com and Wikipedia. The iMac was first introduced in August 1998 and was likely the most significant Mac since the original Mac 128K at least from the standpoint of style. As can be seen above, Power Macs were looking a lot like PCs or were large, ungainly all-in-one structures. The iMac changed this. It was sleek, smooth and colorful. (Other views - Back from below, Back from above.) It was also relatively low in price for an Apple ($1299) and was designed for easy Internet use - hence, "i" Mac. The first model was available in translucent "Bondi Blue." By revision C in January 1999, however, it came in several "flavors" including blueberry, grape, lime, tangerine and strawberry. Mine looks to be a revision C or close to it and is lime flavor. They came with a poster with the word "Yum," capitalizing on the flavor theme. Early iMacs came with 128 megabytes of RAM expandable to 256 megabytes. The revision C had a 6GB hard drive, up from the original 4GB, with a lower price of $1199. IMacs came with a bulit-in CD-ROM drive but no floppy drive, unusual at the time. One could attach an external floppy drive, SuperDrive or Zip drive, however, to one of the two USB ports. 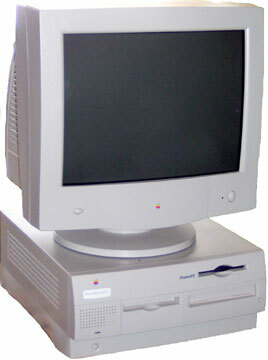 IMacs had a built-in 16 inch CRT monitor which makes this stylish machine heavy - about 38 pounds! 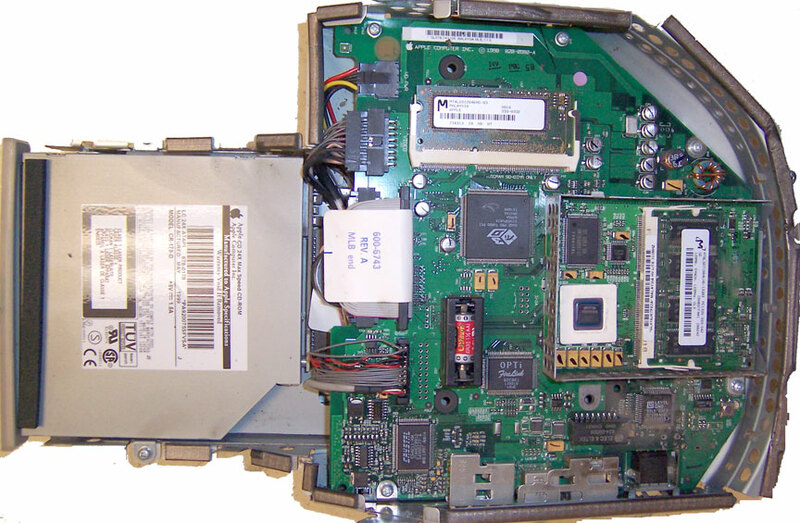 The mother board, CD-ROM drive and hard drive are all located at the bottom of the machine, sliding out easily in a single module making it relatively easy to access vital components such as RAM and the microprocessor. This also avoids having to deal with the monitor or power supply and the dangerously high voltages associated with those components. I bought my iMac at a Synagogue rummage sale on 6-4-06 for $10. It did not come with a keyboard or a mouse. It is in okay cosmetic condition with a few scrapes. It turns on but the monitor does not come on. It sounds like it is not booting. I took out the mother board module and reseated various components without any luck. I may work on it more in the future and in any event the mother board module will make a nice "Inside an iMac" bulletin board. This design of iMac continued until 2002 when the very stylish flat panel monitor with half sphere base iMac came out. 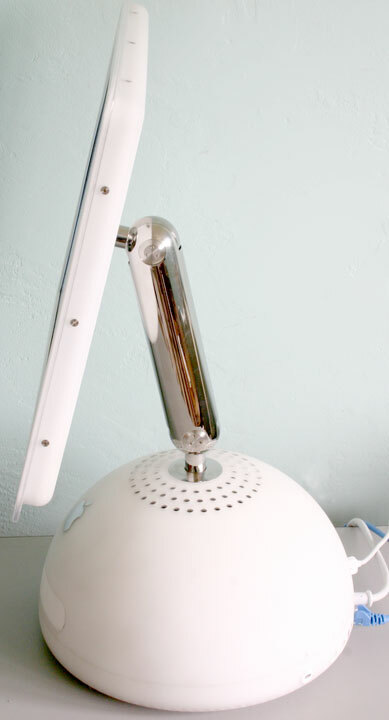 The original iMac design continued in the larger eMac introduced in 2002 with a 17 inch monitor and a white on white motif. The eMac was originally designed for educational use - hence the "e." While later sold to the general public, it again is now sold only to educational markets and as of the Summer of 2006 may be on its way to being phased out eliminating built in CRT monitors from the Mac mix. Power Macintosh G3 Blue and White, code name Yosemite. Introduced January 5, 1999 it eventually came in four processor speeds - 300 MHz, 350 MHz, 400 MHz and 450 MHz. My base model with the 300 MHz processor had an original price of $1,599. It shares the same name and processor as the beige Power Mac G3 also in the museum, but is a completely new model. 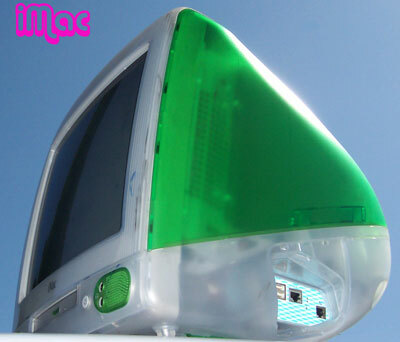 This is the first Mac tower after the introduction of the original iMac and shares the stylish rounded shape and translucent color of the original iMac. 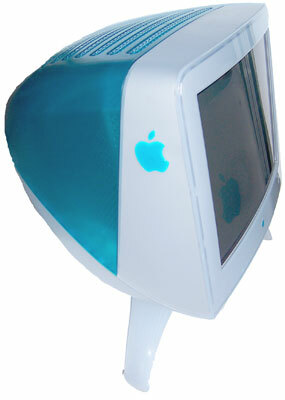 Dr. Mac states the 17 inch CRT monitor, also in a rounded translucent blue design, was $499. The Mac G3 originally came with OS 8.5, but mine has been upgraded to OS 9.2.2. As of September 2006 it can used with OSX 10.4 Tiger, the oldest Mac Tower to do so. (See apple.com.) The minimum standard RAM was 64MB, but mine has been upgraded to 512MB with 256MB RAM cards in two of the four RAM slots. Maximum RAM is 1GB. These were apparently the first Mac towers without a floppy drive. Mine has an optional internal zip drive ($100 originally) a combo CDRW-DVD drive ($100). (See Dr. Mac.) The original hard drive was 6GB, but mine has a second 40GB hard drive added. It was owned by a professional photographer in La Mesa and has specialized photo software including the full version of Photoshop 7 which came out in 2002 and originally cost $609 (see webmonkey), Kodak DCS software for Kodak's professional single lens reflex digital cameras (see Mr. Martin's Digital Camera Museum), and screen calibration software to match screen and printer color. With the various hardware and software upgrades the system would have cost well over $3,000. I purchased it less than seven years after its introduction for $25, less than one percent its original price. Excellent information at several sites: Mac Speed Zone, Wikipedia, apple-history.com, Low End Mac. It's a Low End Mac "Best Buy." 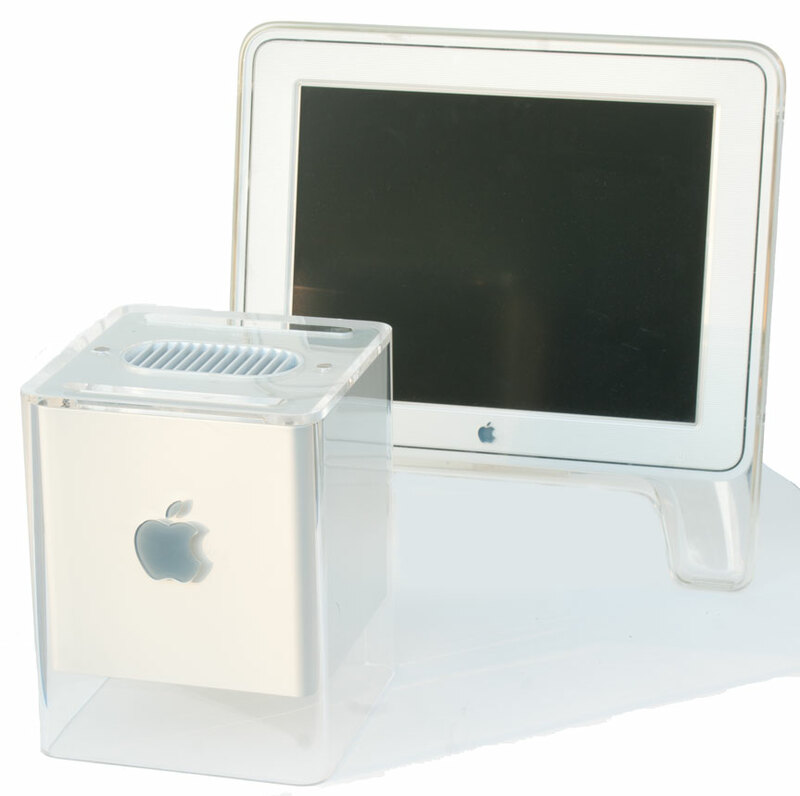 Power Mac G4 Cube (Large Image, With Monitor) sold for less than a year from July 19, 2000 to July 3, 2001, the 8" x 8" x 8" G4 Cube suspended in a 10" clear Acrylic case, together with its clear Harmond Kardon cylindrical speakers, were so stylish to be in the collection of the New York Museum of Modern Art. (Power Mac G4 Cube - Wikipedia and Specifications at www.everyman.com. The cube was pricey, however, with an introductory price of $1799, which did not include a monitor. It was $200 more than the G4 tower which while much bigger was also much easier to service and expand. 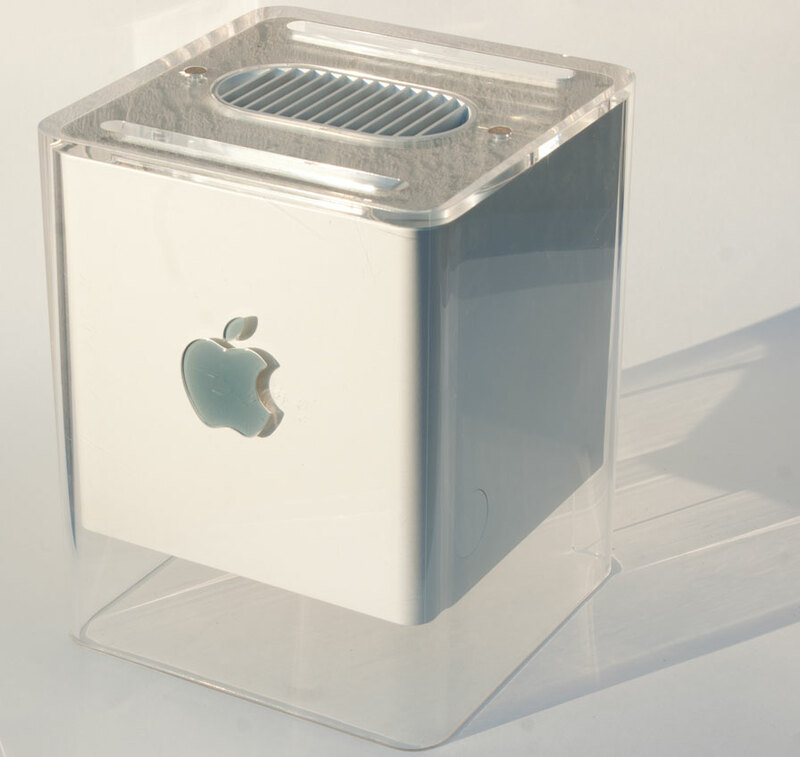 While it was also quite an accomplishment to have desktop computer in an 8x8x8 inch cube, less than five years later the Mac Mini with dimensions of 6.5" x 6.5" x 2" was 16.5% of the volume of a G4 Cube with about 1/3 the price tag! 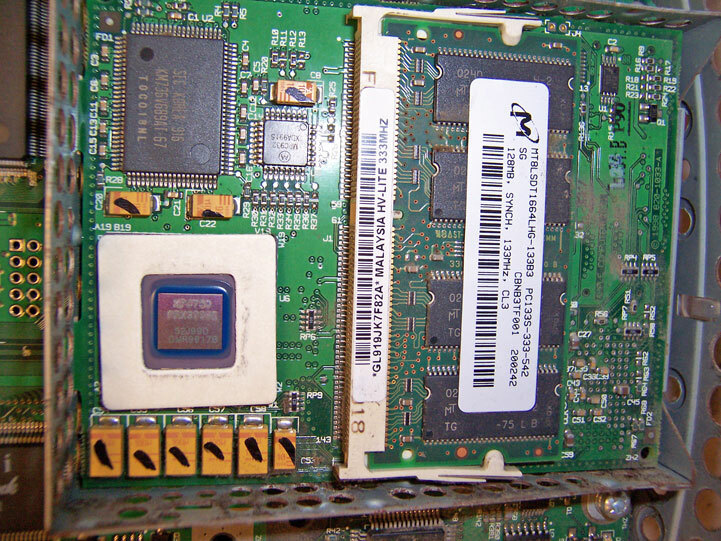 The G4 Cube came with a 450 mHz or 500 mHz processor. The Cube has fanless convection-based cooling system although a fan can be added. I have two 450 mHz G4 Cubes. Both have OSX 10.3.9 Panther as the operating system. The first was acquired at a rummage sale at Christ Lutheran Church in La Mesa in June 2012 for $20. It came with the matching 17" flat panel LCD monitor, the clear Harmond Kardon speakers (the foam is coming off on one of them), and a mouse. When I got home I was reminded I did not have the power supply. I went back the next day and found the power supply which they included for free. Unfortunately, the machine would not power up even after I replaced the dead 3.6V Lithium battery in the computer. I went through the diagnostic procedures in the service manual which is available at www.ifixit.com. The cube comes out of the Acrylic case by simply pushing the hand on the base down. The handle then pops up and you can pull out the cube. It is fairly easy to get at the components by removing screws. Each component lies on top of another component. You basically peel off layers like a onion. After resetting a switch, it still didn't work and I concluded it was likely the power supply. Power supplies on eBay were generally at least $40 with shipping. On June 22, 2012 I saw an ad on Craigslist for a G4 computer with keyboard and power supply for $60. It did not have a CD or DVD drive and I was able to purchase that G4 Cube for $40. My first and second G4 Cubes now work with the second power supply. My first Cube, however, was stuck on the opening screen awaiting passwords I did not have. I was able get on, however, by the procedure under the heading "Tricking Your Mac into Creating a New User Account" in the article "How to Reset Your Mac OS X Password Without an Installer Disc" at www.macyourself.com. It worked fine. With this method you do not need to know the user names or the passwords. I did this with the second machine also since while it booted up automatically, I could not update since that required an administrative password which I did not have. Both cubes now work fine. The first has 384 MB SDRAM while the second has 1.5GB RAM which is the maximum. (See Specifications at www.everyman.com. The first also comes with Microsoft Office, some games and an Airport card. The first has a CD or DVD drive, but it is not working. It had an Age of Empires game stuck in it. While it seemed to be reading it, I could not eject it. It sounded like it was trying to eject it, but it would not push it up. I finally grabbed the CD with a tweezers when it was trying to eject it. I got it! I don't know if I damaged the CD, however. Try this at your own risk! The second cube has no CD or DVD drive at all. All in all I'm quite satisfied having got a complete Cube system for $60 minus a working CD/DVD, together with a working second Cube. 2002 iMac (Flat Panel), (Large Image, Side View) introduced in January 2002 at the Mac World Conference in San Francisco. (CNET News.) 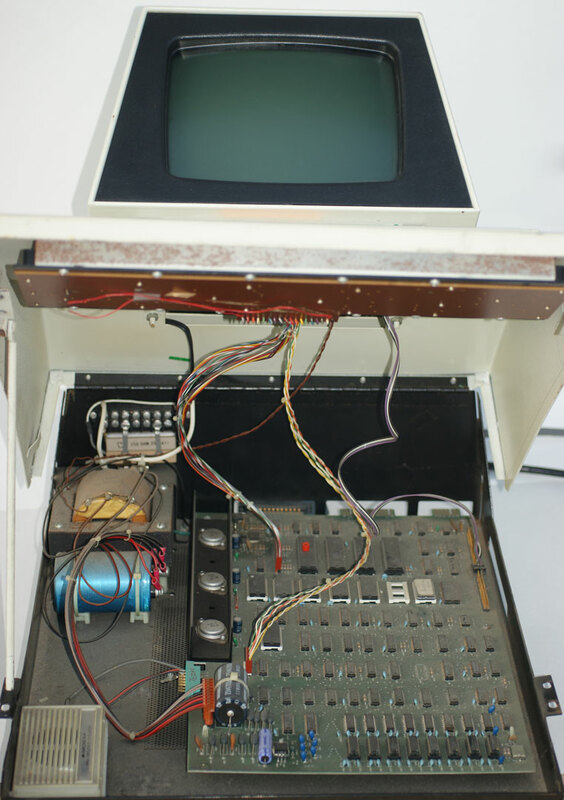 Steve Jobs used this computer to announce the end of the CRT (cathode ray tube) monitor. 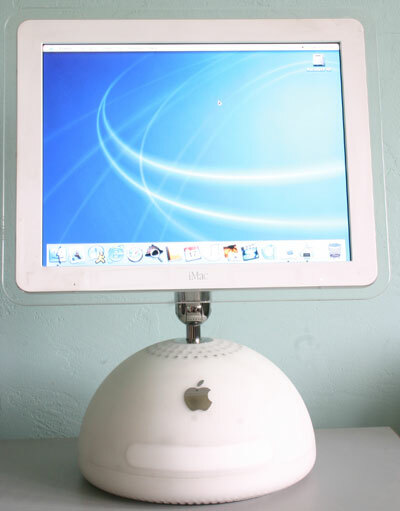 (Apple did continue with the CRT eMac until 2006.) 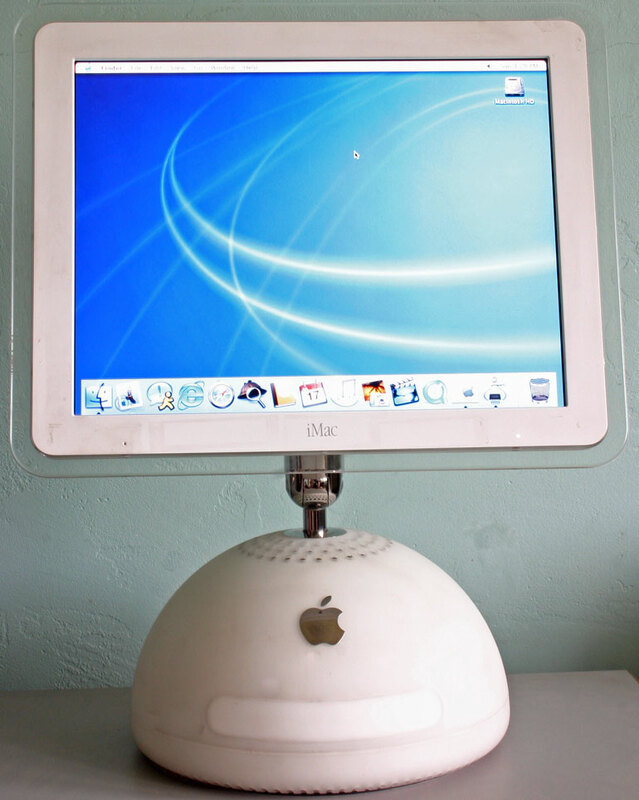 Perhaps the most stylish computer ever, the 2002 iMac has a 10.6 inch diameter half sphere base with a 15 inch flat panel LCD monitor attached to it by a unique pivoting arm. (See side view.) It is perhaps the easiest monitor ever to position. Mine has the faster 800 MHz G4 Power PC processor with a 100 MHz bus and 256 L2 cache. The hard drive is 40GB. It has 768 MB of RAM installed in two slots (256MB and 512MB). The maximum RAM is 1GB. While many of the flat 800 MHz iMacs had a SuperDrive (CD-RW and DVD-RW) mine has only the combo drive (CD-RW and DVD). There was also a later a model with a 17 inch screen. I purchased mine used from CryWolf Computers on 2-25-07 for $299. They had recently moved and were having a garage sale at their old location. They had several flat panel iMacs which they had used in their store. Mine is in good cosmetic condition with a little cleaning needed and some tape residue. It runs fine. It has OSX 10.2.8 installed. It came with a black mouse and keyboard. The mouse did not work, but I had another. I also substituted a white Apple keyboard I purchased at a garage sale over a year ago for about $5. The $299 price is expensive for my collection, but it is also recent enough to be a "user" in my den. I also purchased iWorks '05 for $10, but apparently have to upgrade to OSX 10.3 to use it. This iMac model only lasted a year being discontinued in February 2003. The price ranged between $1,299 and $1,799 depending on configuration. The technical specifications are at Apple Support. The User Guide is still available from apple.com in PDF format with some excellent photos of the iMac. There are several good sites which discuss it. CNET Review, Everymac, Low End Mac, and apple-history. I got another 2002 iMac Flat Panel around early 2012 at an El Cajon garage sale for $60. It is in good working condition except the CD/DVD drive does not work. 2005 Mac Mini, purchased new June 2, 2005, the Mac Mini is very stylish and exceptionally small at 6.5" x 6.5" x 2". This one has a 1.25GHz PowerPC G4 processor, 1GB of PC2700 (333MHz) DDR SDRAM, a 40GB hard drive, a combo CD-RW/DVD-ROM drive, one firewire port, two USB 2.0 ports, built in 10/100BASE-T Ethernet, and internal AirPort Extreme and Bluetooth wireless. I bought a switching device to hook up a single keyboard, mouse and monitor to both a Dell PC and the Mac Mini. You can switch from the PC to the Mac with a press of a button. My Mac Mini has 8,000 times the RAM (one doubling off from Moore's Law) and 100,000 times the secondary storage compared to the Mac 128k. Quite a change in just 21 years. In constant dollars the Mac Mini is roughly 1/5 to 1/10 the cost of the Mac 128k. The Mac Mini does not come with a keyboard, mouse or monitor, however. It does accept any USB keyboards or mice, however, and modern PC monitors. It comes with Apple Works, iLife and Mac OS x 4.0 Tiger operating system. It is my first new Apple ever although I have about a dozen old Apples! For many more photos, click on Mac Mini vs. Mac 128K. Alas, life is not fair! My 2005 Mac Mini was stolen when my classroom in the Spring of 2011 was broken into. They did not take the power supply. I was using it as an extra student computer and fortunately it did not have any valuable information on it. I occasionally search to find a inexpensive replacement on eBay. Apple II (Sort of).I have three Apple II Plus computers, one of which actually has an Apple II top (not yet pictured - still need to take photo). Inside it appears to be an Apple II Plus motherboard, however. The Apple II cover is pretty cool nevertheless since Apple IIs are relatively rare and can sell for hundreds of dollars. The Apple II, introduced in 1977, is one of the most historically significant computers ever made since it took the infant personal computer from the exclusive domain of hobbyists to everyday home users and to business users who bought it to use "killer applications" like the first spreadsheet, Visicalc. The Apple II was a complete computer with a plastic case (rare at the time) and built in keyboard. The Apple II had ports to hook up a monitor or television and a casette recorder to store programs and data. Later, Apple supplied a floppy disk, Disk II, which was less expensive than other floppy drives on the market at the time. The Apple II by today's standard was primative with a 40 column display, upper case letters only, and only 4kb of RAM in the base model, which could be expanded to 48 kilobytes at considerable expense. My Apple II covered computer is in good cosmetic and operating condition except two keys do not work including the "p" key which makes it rather hard to use the very common "print" command in BASIC programming. I purchased it on eBay in late 2004/early 2005 for $50 with a Disk II drive and $25 shipping. It was sold as a II plus with II cover. 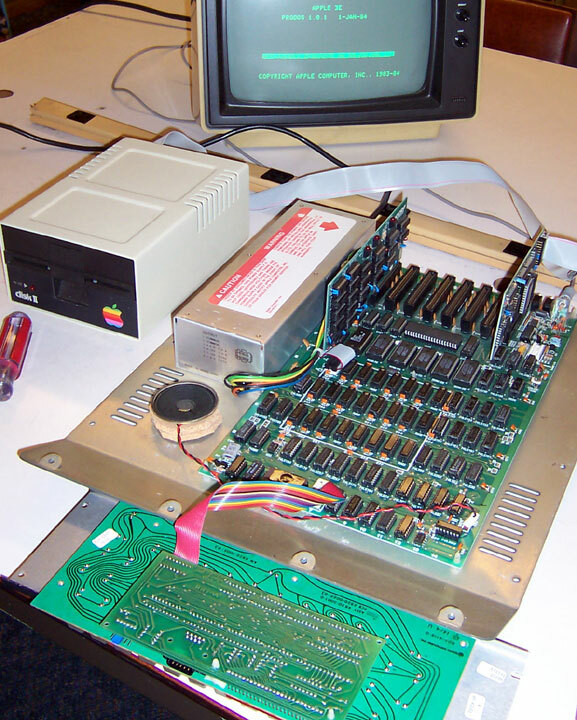 The Apple II's predecessor, the Apple I, was simply a motherboard as shown in photos from Digibarn. Only about 200 were sold at a cost of $666 each. They now can sell for well over $10,000. Apple II Plus, introduced in 1979, is very similar to an Apple II except it has Applesoft Basic built into ROM and came with 16 kilobytes to 48 kilobytes of RAM. Like the Apple II, the II+ does upper case letters only and has a 40 column display. The pictured computer was surplus from the Minneapolis Public Schools whose seal is branded into the plastic case. It also has locks on the cover which were typical of Apple IIs used in schools so that students would not have access to the electrical circuits. It also had a steel loop bolted to it which apparently was used to lock it to a table. Black cased Apple IIs with cover locks were sold to schools under the Bell and Howell name starting Apple's very successful relationship with schools over the years. 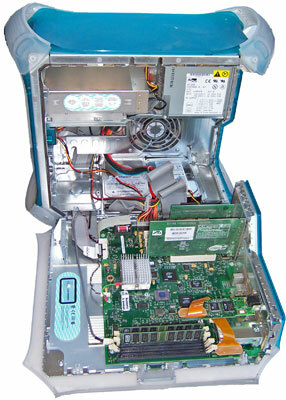 The pictured computer is in fair cosmetic condition. It works, except like my Apple II cased machine, two or three keys do not work. It comes with a working numeric keypad. It was purchased in late 2004/early 2005 for as I recall about $35 which includes shipping. The description said they did not know whether it worked or not. I purchased another Apple II Plus in April 2005 for $20 with $25 shipping. It works including all the keys! For more information on the Apple II family, see Wikipedia's Apple II Family. Also, click to see a dismatled Apple II+ and motherboard. < width=324 height=243 alt="[Apple IIe]">Apple IIe, the successor to the original Apple I (1976), Apple II (1977) and Apple II+ (1979), the Apple IIe was introduced in January 1983. It had 64k of RAM expandable to 128k which also allowed the monitor to display 80 columns. It also has upper and lower case letters.The Apple II series continued for 15 years, making it one of the most successful computers ever. My Apple IIe is in good working condition except one of the drives is going bad. It has the expansion card and a monochrome NEC monitor. Specifications are available at the independent apple-history site. My Apple IIe was a gift from my sister. The Apple IIe Platinum was a gift from a fellow OLG teacher. Both came with considerable educational software. The Apple IIe Platium also included a color Apple monitor, five of the newer style disk drives and two Apple printers. < width=286 height=243 alt="[Apple IIe Platinum]">Apple IIe Platinum, the top of the Apple IIe line introduced in January 1987. The largest change was the addition of a numeric keypad. Specifications are available at the independent apple-history site. This computer continued the basic shape of the original Apple I computer developed by Apple Computer founders Steve Jobs and Steve Wozniak in Jobs' garage in 1975-6. The original computer came with the motherboard only; no case, no keyboard, no monitor. According to the Freiberger & Swaine, Fire In the Valley, The Making of the Personal Computer, 2d ed., page 266 (McGraw Hill 2000), perhaps 200 or so were sold. (The Fire in the Valley Web site contains a timeline, photos and other interesting information regarding the making of the personal computer.) A purchaser of an Apple I had to construct his or her own case as in this example at the Smithonian Institution. 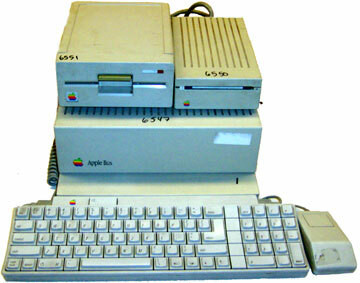 The Apple II followed in 1977 with a keyboard, power supply, BASIC programming language and a plastic case. Apple IIc, introdcued in April 1984 the Apple IIc was the compact member of the Apple II family. It came with 128k RAM, a built in 143k floppy drive, and 1Mhz clock speed. It could be purchased with a 9 inch monochrome monitor which sits on a metal stand. See Old Computers for more information. Mine comes with the original software and a working 9 inch monitor. Unfortuantely, the computer itself does not work. :( It was purchased on eBay for $.99 and about $50 shipping. After this I acquired two more which work. 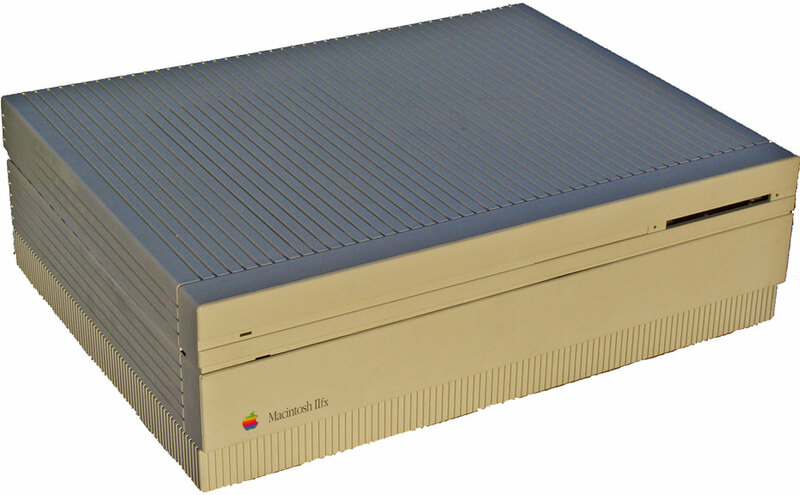 Apple IIgs, the last and most powerful computer in the Apple II line, the IIgs had 256k RAM exapandable to 8mb, operated at 2.8mhz, and could use 5.25" or 3.25" (800k) floppy drives. It was introduced in September 1986 and ceased production in December 1992. It had its own IIgs operating system but also ran most other Apple II software. I purchased the CPU and two drives for about $20 which includes the shipping. I had to get a keyboard and mouse from another source. The system is in good working condition. For more information see the Apple History Site. Also interesting is the Clairmont High Room 110 Apple II page maintained by a Spanish teacher with a passion for Apple II computers. Additionally, old Apple software is apparently available for download from the Apple Computer site. Finally, the Apple II History site also has excellent information. 1992 Apple PowerBook Duo 210 according to Apple-History Site, the Duo 210 was introduced in October 1992 and terminated October 1993. With the TRS Model 100 below, and the Averatec above, Mr. Martin's Computer museum has a nice collection of laptops spaced about 10 years apart - 1983, 1993 and 2004. 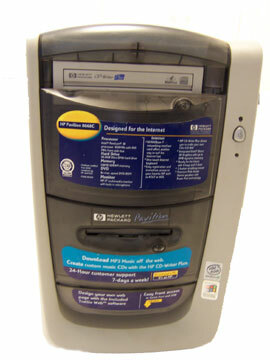 The Duo 210 had a CPU clock speed of 25 Mhz, 4MB of RAM expandable to 32, and an 80MB hard drive. The screen was a 9 inch grayscale LCD (no color). There is a separate floppy drive which attaches to the computer. 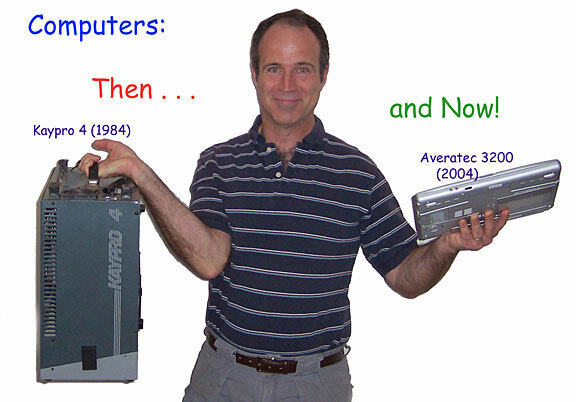 The computer cost $2,250, three times the cost of the Averatec 11 years later with the Averatec having over 100 times the RAM and 500 times the hard disk space. The Duo name comes from the computer's ability to attach to an optional docking station that could have more RAM, hard disk space or a color monitor. The computer hence could be used as a substitute for a desk top computer. My computer was a gift from my sister and the DuoDock (Which is missing the door in front) was purchased on eBay on December 31, 2004 for $4.95 with $12.23 shipping. The computer works. Files are easily transferred to a modern PC by saving them in PC format to a floppy disk. 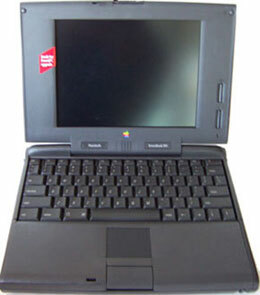 1994 Apple PowerBook 520 (Large Image) introduced May 16, 1994, discontinued June 10, 1995. Price new $2,270. ($3,185 in 2007 dollars.) Uses operating system 7.1.1 to 8.1. 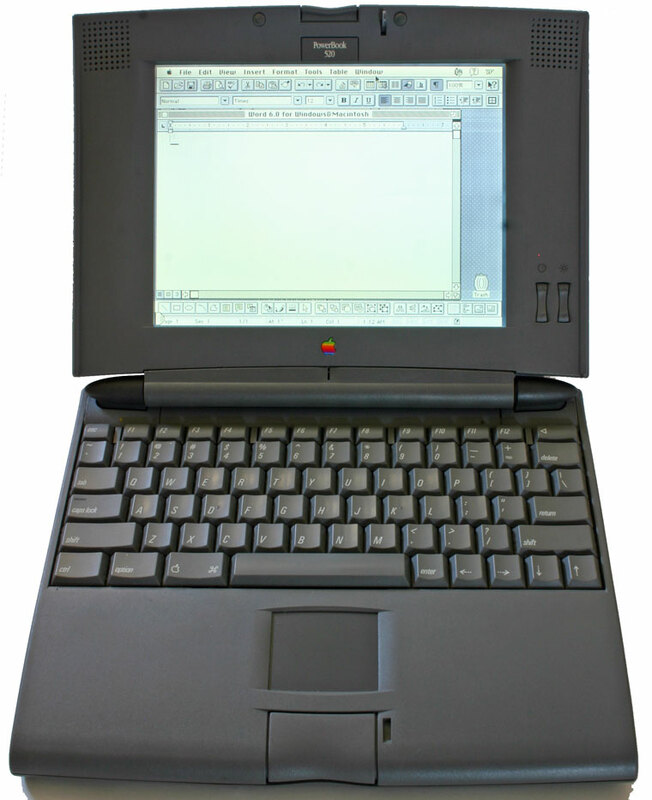 The 500 series had many firsts according to Low End Mac including first laptop with a track pad for navigation, the first with a PCMCIA slot, the first with built in Ethernet, and the first with intelligent NiMH batteries. It used a 68LC040 processor. 4mb RAM expandable to 36mb. 160 or 240mb hard drive. 9.5" passive matrix grayscale screen. I purchased mine at a garage sale on 10-14-07 in the San Carlos area of San Diego for $5. It comes with an extra battery (Absolute brand, 9.6 volts, 1800 mAh, Ni-Mh) in a box which has a price tag of $109.95. It also came with some blank floppy disks, locking cable, charger, manuals and a nice bag to hold things. The seller was a retired photographer who was moving. The computer had been used by her daughter at Standford University. For $1, I also bought an original framed portrait photograph of Henry Kissinger which the seller had taken at a lecture series. (Garage sales are fascinating.) The computer is in great shape cosmetically and seems to work fine. It comes with two versions of Word (the latest is version 6.0) and Claris Works. I have tested it only plugged in so far. All in all a great deal on a vintage Mac laptop. 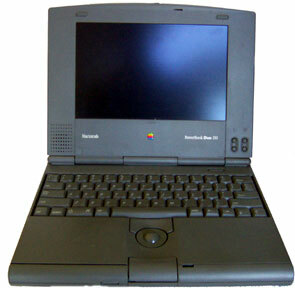 1995 Apple PowerBook 190 according to Apple-History Site, the PowerBook 190 was introduced in August 1995 and terminated June 1996. 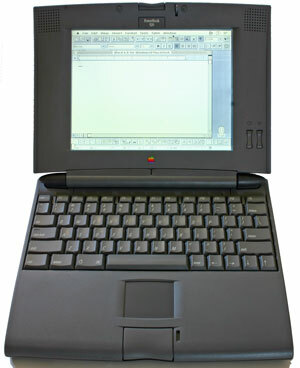 The Powerbook 190 was the last Apple to use the Motorola 680X0 processor. Clock speed was 33 Mhz, with either 4mb or 8mb of RAM, a 500mb hard drive, and 1.4mb floppy drive. Mine has a 9.5" grayscale monitor. A color monitor was also available. Options included an RCA out port for an external monitor and an infra-red transceiver. The original cost was $1,700 with 4mb of RAM and $1,900 with 8mb of RAM. You can buy an iBook today for nearly half the price with 60 times the hard disk space and 64 times the RAM, which happens to follow Moore's Law quite nicely. My PowerBook was a generous donation to the museum in September 2004. It is in excellent cosmetic and working condition. TRS 80 Series: Tandy Radio Shack already had an established system of small electronics stores which are still common today in shopping areas. In August 1977 they released the Tandy Model 1 computer which, along with the Apple II and Commodore PET, was one of the first complete personal computer packages. The computer was in the keyboard. It came with a monitor and sold for a reasonable $599 with a whopping 4K of RAM. An expansion interface could be purchased for an additional $299 increasing the RAM to 16K. Initially, only cassette recorders were available for long term storage. When floppy disk drives became available they were more expensive than the computer. 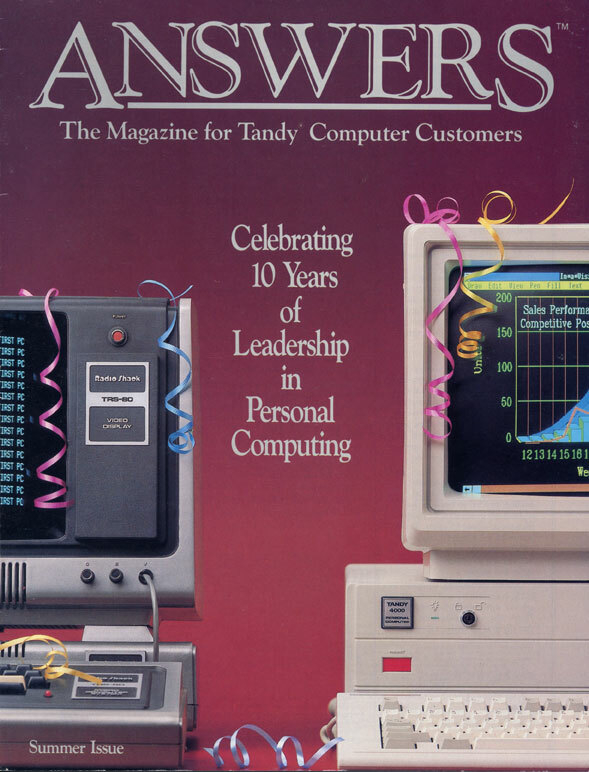 The photo of the cover of the Summer 1987 Tandy Answers Magazine shows the TRS 80 Model 1 on the left and the 1987 Tandy 4000 on the right. In May 1979 Tandy released the TRS 80 Model II which was directed to small business users and had a 500k 8inch floppy drive. 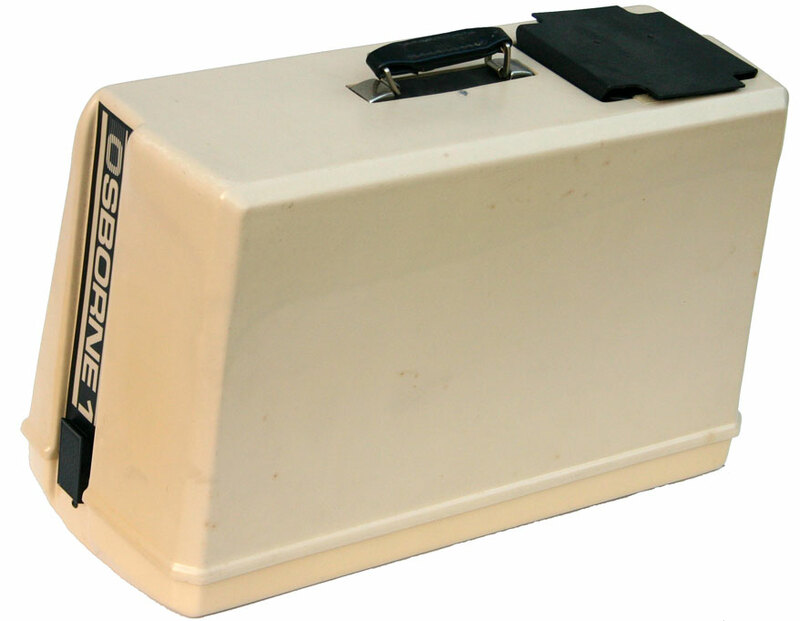 The Model III was released in July 1980. It could be equipped with dual 178K floppy disks and up to 48K RAM. The entire computer - keyboard, monitor and drives were all in one unit. With two drives and 32K RAM it cost $2,495 in 1980, almost $6,000 in 2005 dollars! The final model in the TRS 80 series was the Model 4 released in May 1983 with 64K RAM and dual drives which I have below minus the cathode ray tube! In October 1983 a transportable Model 4 was also released having a suitcase type design like a Kaypro, Osborne or original Compaq. All of these TRS 80 computers had Z-80 processors and the Model 4 could run CPM programs in addition to the TRS DOS. Tandy in July 1980 also relased their less sophisticated Color Computer which was targeted at the home/family/gaming market. Great information, including a historical timeline and links, is available at oldcomputers.net. TRS 80 Homepage is also excellent. Another good historical timeline and summary of Tandy Computers is A Brief History of Radio Shack. Manuals are available online at TRS 80 Hardware Manual Download Page. 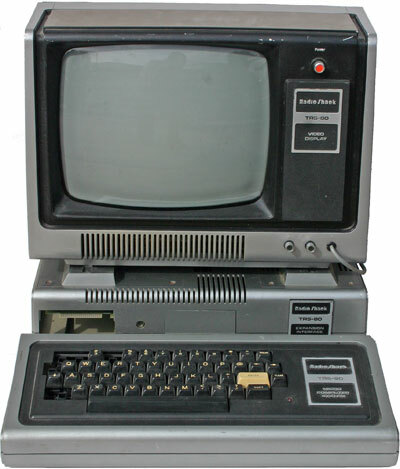 TRS 80 Model 100 Series: Bearing the same family name, but an entirely different computer than the Model 1 - 4 series, was the TRS 80 Model 100, made by Kyocera. This is called by some the first laptop with software develped by Bill Gates. With a great keyboard it has been used by journalists for years. More information about the model 100 is contained below. The basic premise of the machine is still carried on today in small, rugged laptops used primarily for word processing like the Alpha Smarts, marketed primarily to the educational community. The Model 100 was followed by the Model 102 and Model 200. Tandy IBM Compatibles: Starting with the Tandy 2000 in 1983 designed for small businesses and the Tandy 1000 in 1984 designed primarily for home users, Tandy produced IBM compatible computers. The Tandy 2000 was a well designed computer but only semi IBM compatible. The Tandy 1000 and its successors such as the Tandy 1000 SX below were largely IBM compatible and competed directly against the IBM PC Jr. Tandy won that competition with the Tandy 1000 series being highly successful while the IBM PC Jr. was considered by many a flop. 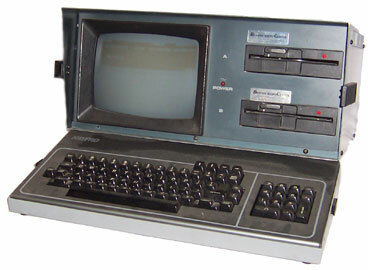 TRS 80 Model 1, (Large Image) with expansion interface and monitor. Computer-keyboard is Catalog No. 26-01004-D, Serial No. 065821. I have a second non-working computer-keyboard with a numeric keypad built in, Catalog No. 26-01006-1, Serial No. 012712. Expansion Interface is Catalog Number 26-1140, Serial no. 051927. Both the expansion interface and computer with numeric keypad have labels indicating they were once owned by the University of Wisconsin. The keyboards and interface were all made in the U.S.A. Monitor is Model 26-1201, Serial No. 943423037, manufactured October 1979 and made in Taiwan. The monitor and computer-keyboard without the numeric keypad work allowing me to run BASIC programs. I do not have a separate power supply, although the expansion interface has a power supply built in and this properly supplies power to the computer-keyboard. I do not have the connections to test the expansion interface further. The working computer-keyboard is missing 5 keys, although they key pads still function without the keys. The cosmetic condition of the items is fair to good, although clearly well used. Purchased in January 2007 on eBay for $122.50 plus $36 shipping from Madison, Wisconsin. Included is the "User's Manual for Level 1," by David A. Lien, copyright 1977, First Edition, Second Printing 1978. This manual itself was a great success and is a very cool part of early personal computer history. Dr. Lien was Dean of Mathematics and Physical Sciences at Grossmont Community College in El Cajon, California, about 3 miles from where I live. This Web site started out as a project for an introductory Web design class I took at Grossmont College. I have also taken a Computer Networking class there. Dr. Lien also authored a Tandy Book on MS-DOS I remember reading in the early 1990s. 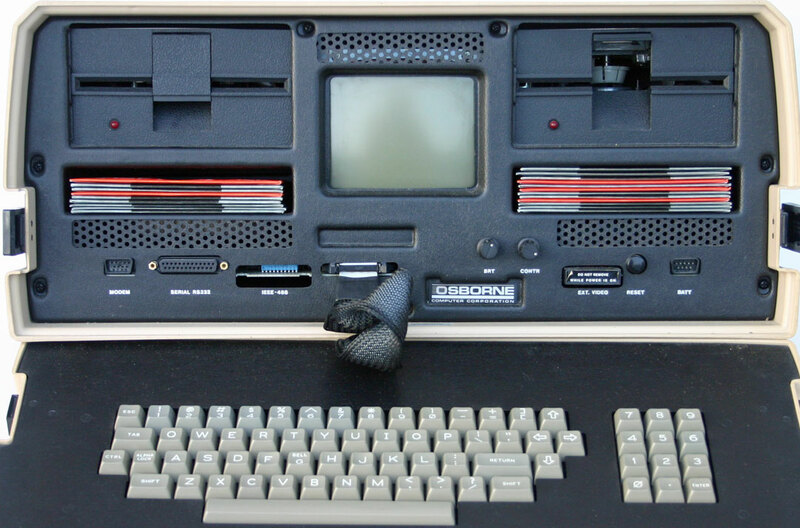 Very interesting information about the Model 1 is at Ira Goldklang's TRS-80 Revived Site Model I Page, oldcomputers.net, digibarn, wikipedia, and TRS-80 Homepage. One site has a 1979 Radio Shack TRS-80 Catalog which is fascinating. A single disk drive cost $499, equal to almost $1,400 in 2007 dollars! Each 5.25" diskette held 89,600 bytes (89.6 kilobytes) of data and cost $5.95, or $16.68 in 2007 dollars. As of April 2007 you can buy a 2 gigabyte (approximately 2,000,000,000 (two billion) bytes) SD card for $15 at amazon.com. The 2GB SD card for less money in constant dollars holds over 22,000 times more information than a TRS-80 diskette. 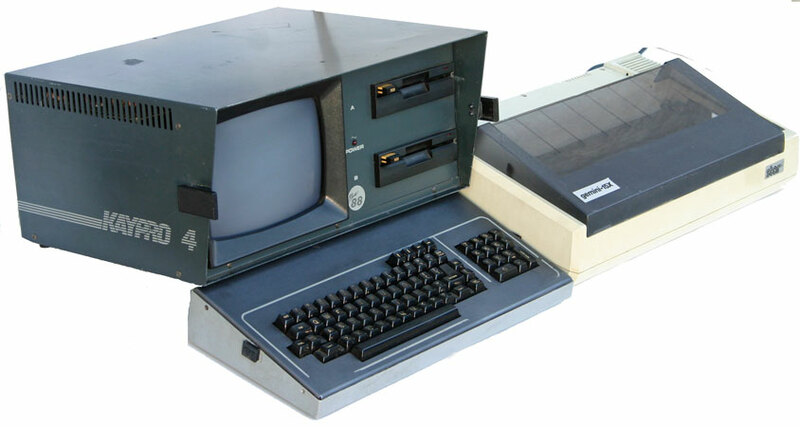 A "Model II 'Deluxe 2 Megabyte Business System'" in 1979 cost $8,737 (almost $25,000 in 2007 dollars), with 1,000 times less secondary storage than a $15 two gigabyte SD card! TRS 80 Model 4, as can be seen from the photo, this has excellent color graphics! Okay, not really. Let's just say Mr. Martin is really into computers! 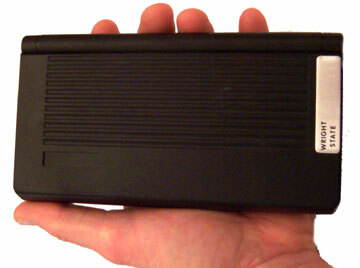 Seriously, this is the outer case to a TRS 80 Model 4. Purchased as part of a lot of 8 computers on eBay, the cathode ray tube (CRT) unfortunately did not survive the trip from Detroit. The plastic brackets holding it to the frame broke loose slamming the back of the CRT into the back of the case. The CRT dissambled from the rest of the computer easily, however, and I'm hopeful that I can fix this Model 4 someday. (If not, I have a great Halloween costume!) The rest of the computer seems to be intact. (View without the CRT.) As can be seen from the internal view, the floppy drives take up much of the space. The motherboard is on the back. Notice the 3-1-83 date on the bottom. Elsewhere inside a part says April 1983. As indicated above, the release date was May 1983. I later acquired an other Model 4 that is fully intact and working! 1983 Radio Shack TRS-80 Model 100 Portable Computer, called by many the first laptop computer, with software developed by Bill Gates, the 1983 Model 100 is still used by journalists (see 2001 SF Chronicle article) and others who need a small rugged computer, with an excellent full-sized keyboard, untied to the power cord, for writing and note taking. It runs on 4 AA alkaline batteries for up to 20 hours, or on AC power. While it has no disk drive or hard drive, it does have its own internal non-volatile memory kept alive by an internal rechargeable nickel cadmium battery. The model 100 software was specifically designed by Gates and others to easily save files. Gates discussed his role in the software development in a Smithsonian interview. 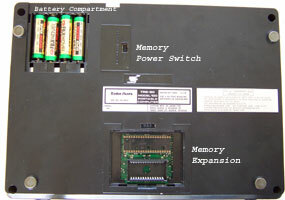 Back of Model 100 showing batteries, memory expansion, and memory power switch. Users today can transfer files to a modern PC (I'm still figuring out how to do this). Club100 sells refurbished Model 100 and later Model 102 computers and parts. 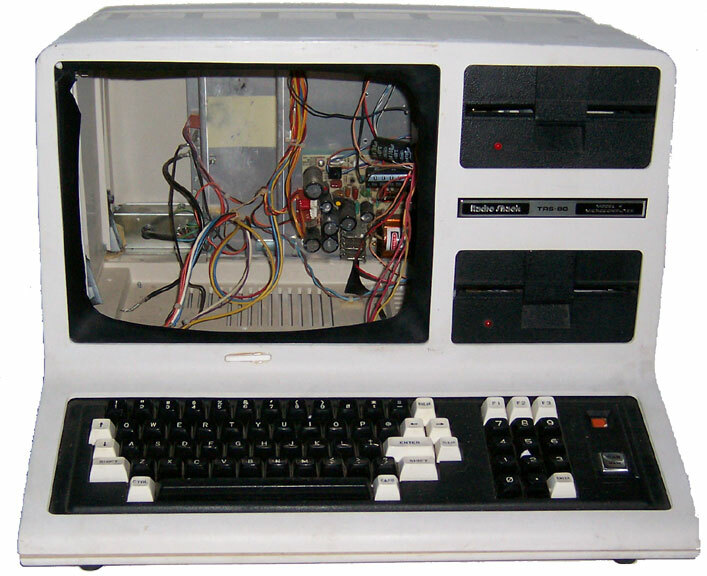 The Web Site Old Computers describes the development of the Model 100. The Japanese company, Kyocera, produced the Kyotronic KC-85, NEC PC-8201a, Olivetti Olivetti M-10 which had a tiltable screen, and TRS-80 Model 100, all of which were similar. Mine was purchased on E-bay for $25 (shipping included) in August 2004 and is in good condition, except a small column of LCD elements is not active and I do not have power cord. I purchased a second one also in August 2004 for $24.50 with local pickup. A full manual in PDF format is available at TRS 80 Hardware Manual Download Page. The Obsolete Computer Museum has a 3D rotating photo of the Model 100. Tandy 1000SX - Beating the PC Jr.
Tandy 1000 SX (1986) an eight bit, XT class computer using an Intel 8088 microprocessor like the original IBM PC. Originally sold for about $800. Originally came with 384 kilobytes of RAM expandable to 640 kilobytes. (See Radio Shack Support - Settings, Support - Index and Oldskool Tandy 1000TX and 1000SX Pictures. Mine comes with two floppy drives, one 5.25" and one 3.5". I bought it on eBay for about $20 as I recall including shipping. It did not come with a keyboard, however. Unfortunately, the 1000SX has a unique 8 pin keyboard port and I do not have a keyboard for it. It does power up and boots, however. It appears to be a solid, well made computer. I purchased Tandy Deskmate software for it a garage sale. The 1000 SX back reveals has five expansion slots, audio and video in ports, RGB monitor port and a light pen port. Update: On 9-15-08 I purchased two more Tandy 1000-SX computers, both with working keyboards, for $19 with $26.50 shipping from Arizona. That was a pretty decent price since the keyboards are fairly rare and tend to be pricey. They had originally been used by the Bisbee, Arizona School District. One of them was sold in working condition and one for parts. The one in working condition indeed does work. I tried it out with MS-DOS and GW Basic for the Tandy 1000 SL which I had purchased years ago at a yard sale for something like a $1 or $2. It worked fine. That machine has 640K RAM and two 5.25" floppy drives. The parts machine has 384K RAM. It had two loose floppy drives. I took the machine apart and hooked up the drives. While the machine powers on, it comes up with the message to insert system disk. The drives do not appear to be reading the disks. The drives do not light up and I don't hear them. Finally, I tried my original machine with the 5.25" and 3.5" drives. It has 640K RAM and works well now that I have a keyboard. Since my Deskmate software is for the Tandy 1000 SL, I don't think it will work on the Tandy 1000-SX. Larger Image Commodore PET 2001 (circa 1979) The Commodore PET was the first Commodore computer. 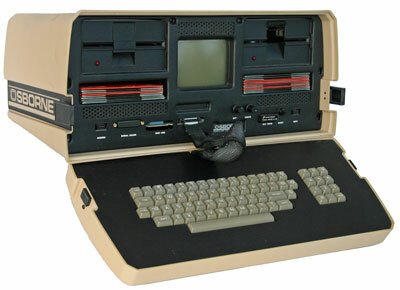 It was originally introduced in January 1977, ahead of what were to become the other two ready to use computers, the Apple II and the TRS-80 Model 1. (The Amazing Commodore PET - www.commodore.ca. A very complete article with links to many original sources.) 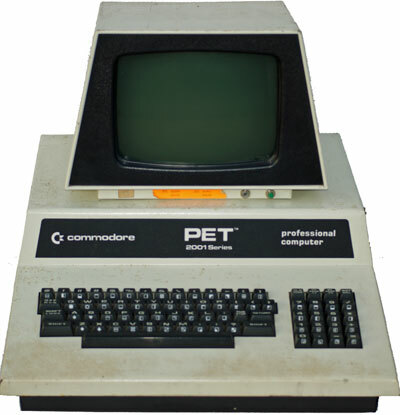 The PET utilized the MOS 6502 processor, also used on the Apple I, Apple II, Atari 800XL, Commodore VIC-20 and Commodore 64. (Id. See also MOS Technology 6502.) 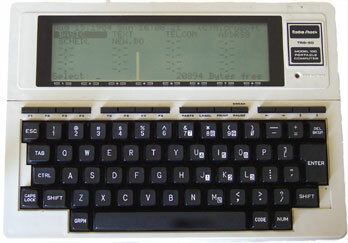 The original PET 2001 had a "Chiclets" keyboard and a built-in cassette recorder for secondary storage. It had a 4 kilobytes of memory. A moderately priced, modern desktop computer might have 4 gigabytes of memory - 1 million times more than the original PET! The "Chiclets" keyboard generated a lot of complaints. 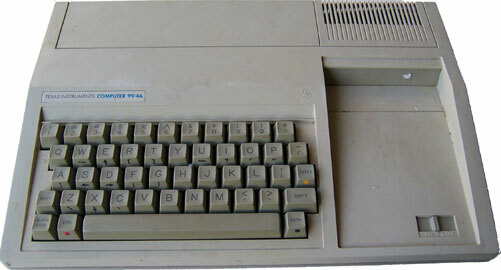 Therefore, by 1979 Commodore introduced a version of the PET 2001 with a full sized keyboard and a numeric keypad. The built-in cassette recorder was eliminated. The new version came with either 8K, 16K, or 32K RAM. The Commodore PET was unique in several ways. The monitor looks like a separate monitor, but is attached to the top of case. The entire top of computer, including keyboard and monitor, lift up like a car hood. (Image with hood up.) Like many car hoods, it remains it place with a rod you swing into place. Mine has a 9 inch diagonally measured green monochrome monitor. Mine is a PET 2001-16N, which means it came with 16K RAM. When mine boots, however, it shows 32K RAM available. I assume it was therefore upgraded from 16K RAM to 32K RAM. Multiple ads in the November 1979 Byte Magazine list the price for a Commodore PET 2001 with 32K RAM as $1,295. That's equal to $3,847 in 2009 dollars! A PET 2040 Dual floppy drive also sold for $1,295. A complete system with two drives would hence be $2,590, or about $7,700 in 2009 dollars! When I purchased my used PET 2001 on July 15, 2009, Costco had a complete e-Machines desktop unit with 3GB RAM, 160GB hard drive, DVD burner and wide screen LCD monitor for $400. A complete computer system in 1979 therefore cost about 20 times more than a system today in constant dollars. The speed, RAM and secondary storage are also orders of magnitude greater today. The uses, capabilities and impact of a computer today were difficult to image thirty years earlier. I purchased my Commodore PET 2001-16N (serial no. 0709863) from an ad on Craigslist on July 15, 2009 for $80. A similar non-working model sold recently on eBay for about $100. An original model, also not working correctly, also sold recently on eBay for almost $200. $80 therefore seemed like a reasonable price for a local sale. Mine came with a Commodore PET 2031 single floppy drive, serial no. V1003945. 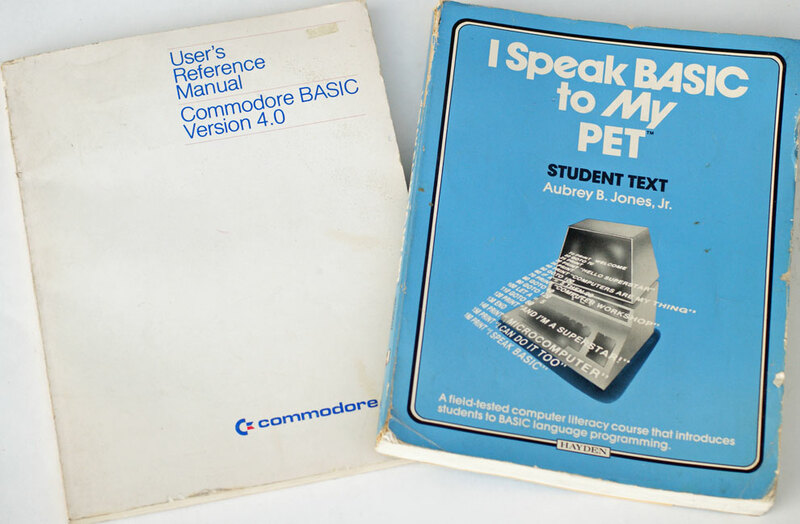 It also came with two books, Abrey B. Jones, Jr., I Speak Basic to My PET (Hayden Book Co. 1982) and User's Reference Manual, Commodore Basic Version 4.0 (1st edition, Commodore Business Machines, July 1980). The seller of my PET is a Macintosh specialist running a business called the Macintosh Guru. The first computer he used was a Commodore PET when he was 8 years old. Mine is in decent condition. There is some rust coming through the metal case. It turns on and boots to the command line. Only a few keys presently work. The seller thought it may just be oxidation on the keys. Removing the keyboard and cleaning the contacts might therefore fix the problem. While it didn't make a sound in seller's office, when I got it home and tried it I got a continuing buzzing sound. This computer has an added internal Archer (Radio Shack) speaker. It also has an added VisiCalc ROM chip. VisiCalc was the first spreadsheet program, initially made for the Apple II. The Apple II's success is often attributed to the VisiCalc "killer app." VisiCalc was later released for the Atari 400 and 800, the Commodore PET, the TRS-80, and eventually the IBM-PC. (VisiCalc Wikipedia.) The Apple II, Commodore PET and Atari 400/800 all shared the same MOS-6502 processor and could hence use the same code. (TRS-80.org - VisiCalc.) While initially I thought the VisiCalc ROM was the program itself, it likely is simply required to run the program from a floppy drive as an extra measure of copy protection. TRS-80.org - VisiCalc states the Commodore PET version of VisiCalc came with "with a special ROM chip that needed to be plugged into a socket on the PET motherboard" in order for VisiCalc to run. VisiCalc on tape or disc may still be needed. (If it is the program, you may type VC at the command line to access the program. See HP Forum Archive 15 at the Museum of HP Calculators referring to an HP 75 pocket computer/calculator.) VisiCalc for the PET with 32K RAM is available at zimmers.net which states: "This version should run on all 32 kB PET models that have the 901472-04 ROM at $9000." PET/CBM FAQs - Programming, portcommodore.com, at the bottom, also confirms that the VisiCalc ROM chip is for copy protection. 1981 Commodore Vic 20, as indicated in Old Computers, the first color computer for under $300 ($299) and the first with one million sold, hitting that mark slightly before the Apple II. That was without a monitor (you could use a television) or storage device. The optional cassette player for storage is shown here. To put it in perspective, $299 then is worth about $625 today according to the CPI, more than enough to get a nice desktop computer, monitor and printer, or a laptop. 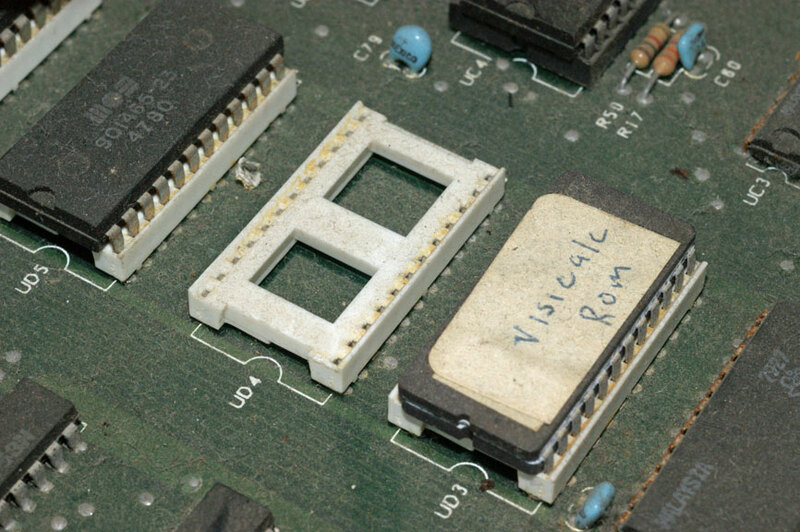 The Vic 20 had a whomping 5K of RAM! I have two and a cassette recorder. Front of Commodore Vic 20 Box, the box is as interesting as the computer. 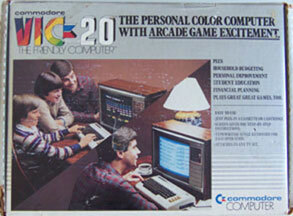 A happy dad and kids with early '80s clothes and hairstyles use the "friendly computer" to play games and keep track of finances. Back of Vic 20 Box. The Vic 20 was followed by the very successful Commodore 64 with 64 kilobytes of RAM, the Commodore 128 with 128 kilobytes of RAM and also the ability to use the CP/M operating system, and the Amiga noted for its ability to use multi-media. Sides of Vic 20 Box. While very successful throughout much of the 1980s, Commodore eventually fell on hard times and filed for bankruptcy in the mid 1990s. Old Computers has a timeline of Commodore history. Commodore 64 - Best Selling Computer Ever! Larger Image 1982 Commodore 64, an excellent Wikipedia Commodore 64 article with many links states the Guiness Book of World Records lists the Commodore 64 as the best selling computer model of all time with 22 million units sold. 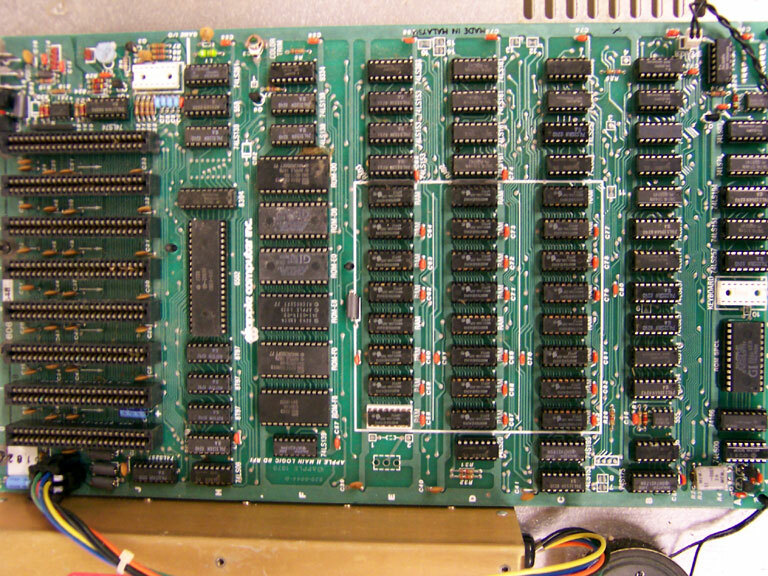 While the same basic design of the Vic 20, it increased the RAM from 5K to 64K. A floppy disk drive was also available. It could be hooked up to a television or a monitor. It was sold in department stores and toy stores, not just computer stores. There were a wide assortment of games for it, but the keyboard and 64K RAM were also sufficient for some more serious uses. The initial cost was $595 for the basic unit. With a monitor and drives the price would substantially increase. It appealed to a wide range of users and still has a following today. Mine was purchased on eBay with a lot of 8 computers in December 2005. It boots to the built in Basic. The floppy drive powers up and spins when the computer is turned on. I haven't been able to have it boot from the floppy drive, however. The floppy drive has a large crack in the back. It also has an external 1200 baud modem. Not exactly high speed cable or DSL, but that was pretty good at the time when 300 baud modems were common. In 1992 the speed of the modem in my Dell computer had only increased to 2400 baud. 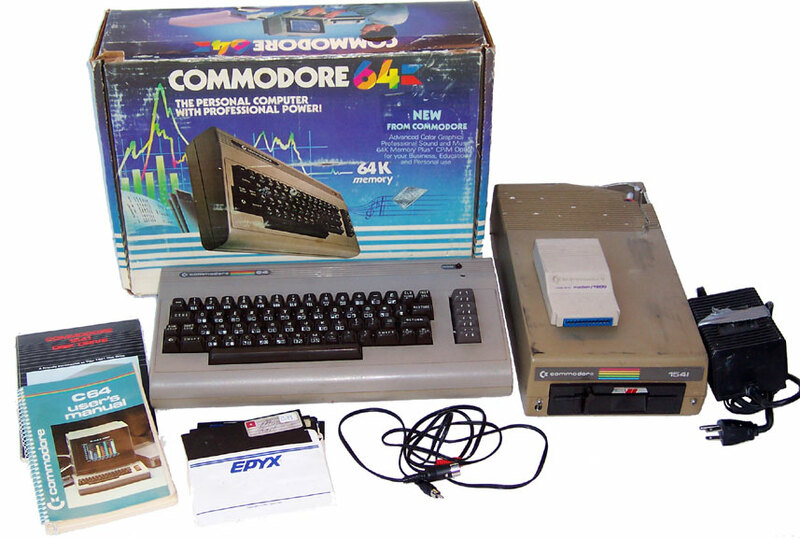 I remember thinking of buying a Commodore 64 in 1983 to write my masters thesis, but eventually rented a Kaypro 4 instead since it had an excellent keyboard, a monitor, two 400k drives and included WordStar and Perfect Writer word processing software. 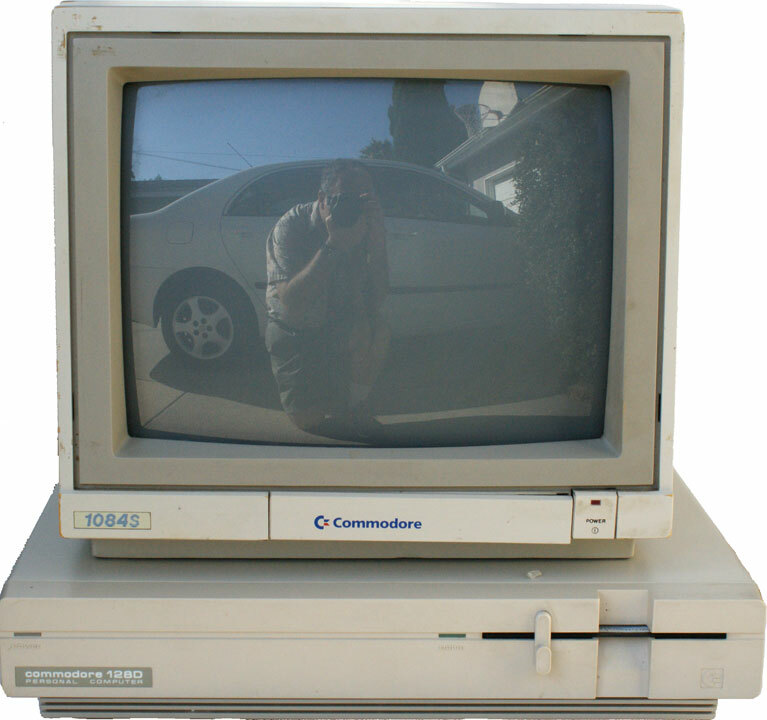 Larger Image Commodore 128D (1988) The Commodore 128 was introduced in 1985 as a successor to the immensely popular Commodore 64. The 128 had several improvements over the Commodore 64 including RAM increased from 64K to 128K and further expandable to 512K. It also had two separate processors, a MOS 8502 processor which was an improved version of the MOS 6510 processor used in the Commodore 64, and a Z-80 processor which allowed the Commodore 128 to run the CP/M operating system. The two processors allowed it to run in three distinct modes: Commodore 64 mode which was 100% compatible with Commodore 64 programs, Commodore 128 mode, and CP/M mode. According to Commodore 128 - Wikipedia, in CP/M mode the Commodore 128 with the Commodore 1571 floppy drive could "run almost all Kaypro-specific CP/M software without modification." That's very cool for me because I have several versions of Kaypro software as well as a masters thesis written on a Kaypro. The original Commodore 128 had a built in keyboard and no built in floppy drive. The Commodore 128D introduced in the Fall of 1988 had a separate keyboard and a built in version of the Commodore 1571 floppy drive. This was also in keeping with the general design of many desktop PCs at the time. The computer is designed to have a monitor set on the top. Commodore.ca has a detailed discussion on the Commodore 128 including a Systems Guide. My Commodore 128 D (Model C128D) came with a Commodore 1084S Color Monitor made in Taiwan June 1988. The computer itself was made in Hong Kong. This computer has a metal case. Another version of the 128D apparently had a plastic case. My computer and monitor was purchased at a La Mesa, CA estate sale on July 17, 2009 for $5. It is in good cosmetic condition and comes with the original box. It boots. Unfortunately, it didn't come with a keyboard so I can't check it out further until I locate a keyboard that works with it. The following day I went back to the estate sale looking for the keyboard. I didn't find the keyboard but did find and buy for about $5 a Commodore 1571 external disk drive that appears to be in good condition. A discussion at The Vintage Computer discusses modifying other keyboards to work on a 128D. Commodore 128 Alive also discusses the possibility of using a built-in keyboard from an original Commodore 128 on a Commodore 128D. The box has the price tag. It was bought at the "Computer Outlet" in San Marcos, CA (North San Diego County). List price says $599.99. "Our price" is listed as $539.99. One of the tags has written in pen, however, $499.99, apparently the price paid. That equals $911.62 in 2009 dollars, inflation having been pretty tame in the past twenty years compared to the twenty years before that. The monitor was extra. The side of the box lists the features, available enhancements and what's included in the box. The Commodore 128 was a unique and intelligently designed machine. I remember reading about it in the Summer of 1985 in a computer magazine and being intrigued by its ability to run CP/M programs. It was successful with one reader of my site indicating 4 to 5 million were sold, a huge number for a particular computer model. That figure is particularly impressive since when it was introduced in 1985, it had to compete with the growing surge of MSDOS machines, falling prices and Apple's introduction of the the Macintosh with its graphical user interface. It remains an historical machine, combining two of the historic 8 bit operating systems - the Commodore 64 DOS and CP/M. Commodore would follow the 8 bit Commodore 128 with the 16 bit Amiga that had advanced multi-media features. Keyboard Update: I was runner-up on a 128D keyboard on eBay being outbid at the last moment. Bummer :(! I did buy two Commodore 128s and a Commodore 64 without power supplies and without assurances they would work for $1 and $24 shipping. My thinking was that at the garage sale where I got the 128D, I also got a power supply for a 128. (At least I assume so - it is beige Commodore power supply and has the right connector.) Therefore, with that power supply there was a decent chance one of the 128 computers would work. Also, I could try and use one of the 128 keyboards to fashion a keyboard for the 128D. Outcome: I can't get the 128 computers to power up. Bummer again :(! It might be the machines or it might be my power supply. My power supply feels really light compared to a Commodore 64 power supply. I took off the case to make sure it was all there. It looks complete. I opened up a 128 computer. The keyboard attaches to a 25 pin connector - one row of 13 and one row of 12 just like parallel connectors. 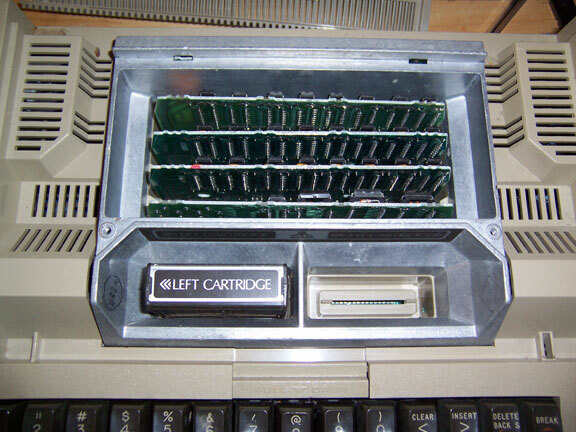 The connector on the 128 keyboard is female as is the connector on the 128d computer. It seemed like I probably just needed to attach the two. I had a converter with two male ends. I joined one end to the 128 keyboard and one to the 128D computer. (It was actually more complicated since I had to cut away part of metal around the end that the 128 keyboard was going into.) I hit a key and got a response on the monitor! Unfortunately, it's not the right response! For example, you hit the "h" key and you get a six. Not all the keys gave a response, but many did. Unfortunately, no key gave the correct response. Therefore, apparently you cannot simply convert a 128 keyboard to a 128d keyboard even though they both have 25 pins or receptors and even though they both look pretty much the same. Bummer once again:(! Three strikes. I'm out. If anyone has other ideas, please let me know! I'll keep looking for 128D keyboards. Patience is a virtue. I looked for two years off and on for a Tandy 1000 keyboard and eventually got two. My dilemma points out that standardization is a great thing. Isn't it nice to know that if you spill a Diet Coke on your PC keyboard you can go to Target, Wall-Mart, or wherever and get another one for $10 or so? 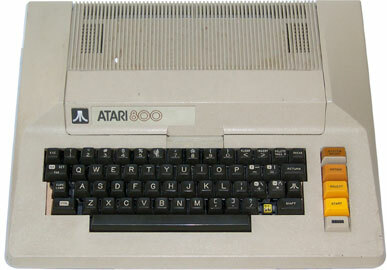 Atari 800, released in November 1979 along with the Atari 400 at a price of $995.95. This equates to over $2,700 in 2005 dollars for a simple gaming machine with 8 kilobytes of RAM expandable to 48 kilobytes! That's with no monitor and no storage devices. A floppy drive was about $600 (over $1,600 in 2005 dollars) and stored 90 kilobytes on single sided 5.25 inch floppy disks. The 800 and 400 were Atari's first computers, although Atari created the first commercial video game, Pong, back in 1972. I remember playing Pong when I was in high school at my cousins. My Atari 800 was one of a lot of 8 computers purchased on eBay in December 2005. It is in good operating condition. There is a latch in front to reveal the two cartridge slots for games/programs. Behind this you can remove two screws to lift off the top revealing the slots for RAM. Mine is fully populated with three 16k RAM cards. 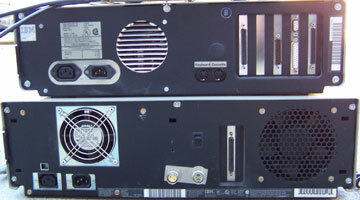 Photo showing RAM slots and cartridge slots. The card in front of the RAM cards has OS written on it and I assume has the operating system on it. Included with the computer were 13 cartridges: Defender, Missle Command, Donkey Kong Junior, Atariwriter, Asteroids, QIX, Basic, Millipede, Pole Position, Football, Centipede, Star Raider, and Pac-Man. Obsolete Technology Website has excellent information about the Atari 800 including the accessories available and a timeline of Atari Computers. 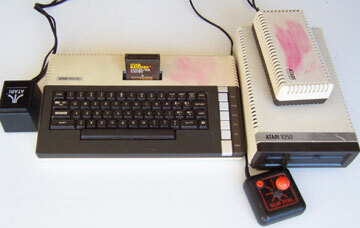 1983 Atari 800XL, introduced in 1983 as a cost reduced version of the original Atari 800 (1979). It has 64 kilobytes of RAM and uses solid state cartridges for programs. I have two 800XLs. I believe both work, but one does not have the power supply. I have one Atari 1050 disk drive which powers up, but I do not have disks to test it. The capacity of the 1050 dirve is apparently 128 kilobytes. I have two programs; Star Raiders and recently purchased Atari Logo. Texas Instruments TI 99/4A, the stylish TI 99/4A, with its black and metallic finish, was the first 16 bit personal computer. Two excellent sources of information about the TI 99/4A are Wikipedia and Timeline 99. The TI 99/4A operated at 3.3 MHz, but had only 256 bytes of memory dedicated to RAM, expandable to 32kb. Despite many innovations including an available speech synthesizer, the TI 99/4A had a very slow BASIC programming language. 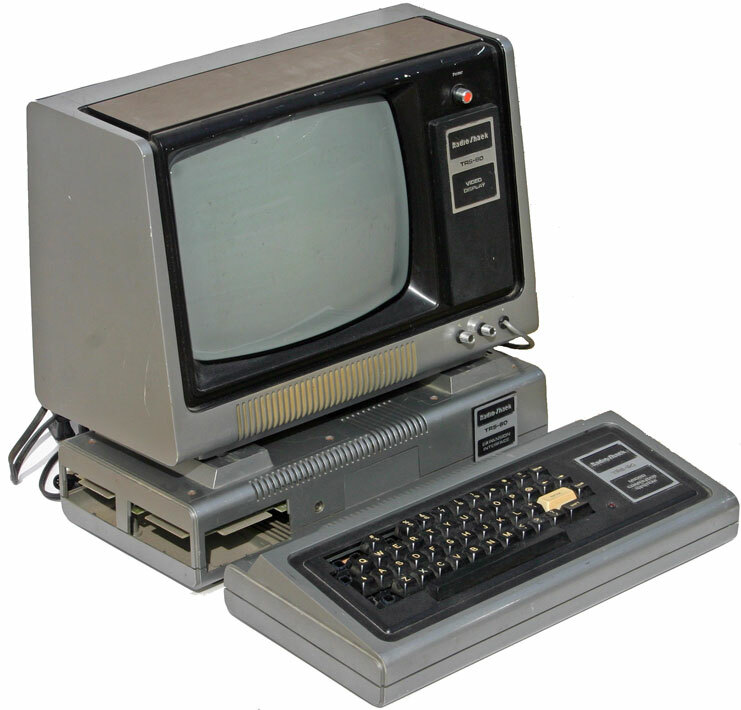 The TI 99/4A was an upgrade to the previous TI 99/4 which was introduced in 1979 for a suggested retail price with monitor (essentially a 13 inch color television) of $1,150. 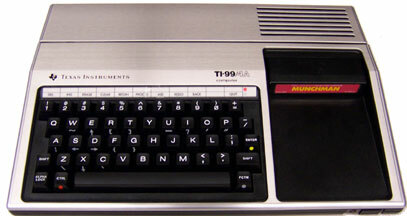 The improved TI 99/4A was released in 1981 at a suggested retail price of $525 for the computer alone. 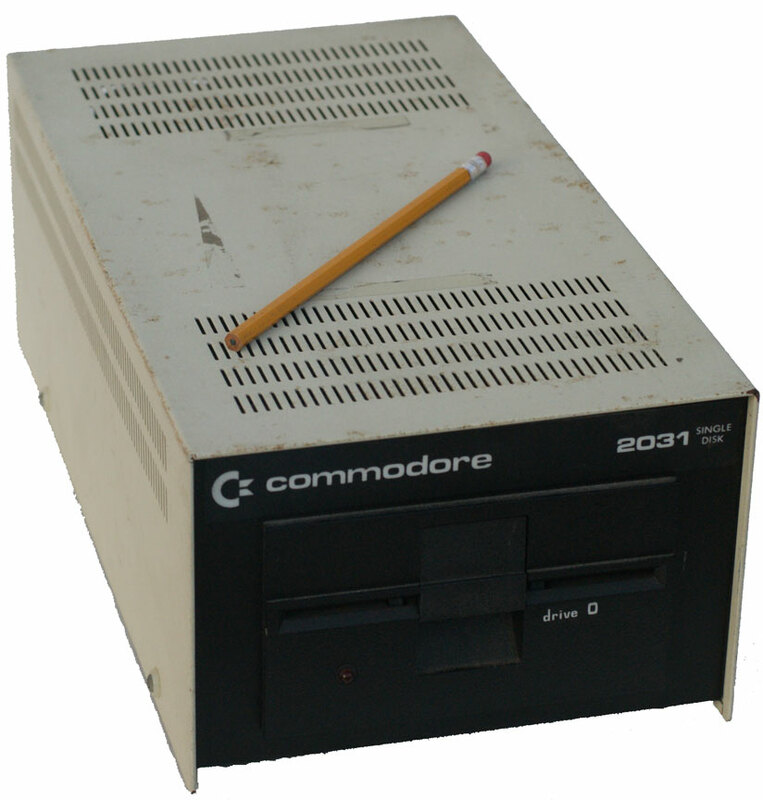 The TI 99/4A faced stiff competition from other home computers such as the Commodore Vic 20. The price dropped to $150 in February 1983, below TI's costs in producing it. 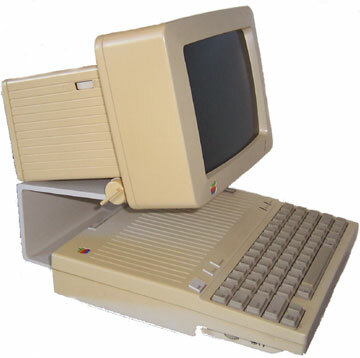 A lower cost version with a beige body was introduced in June 1983 with a retail price of $99. Texas Instruments, one of the inventors of the integrated circuit, decided to exit the home computer business in October 1983 and the TI 99/4A was discontinued in March 1984. Nevertheless it maintains a following even today. The TI 99/4a used solid state program cartridges. A cassette tape program recorder could be added to store data. A large expansion system box with a floppy drive could also be added. My black and metallic TI 99/4A was purchased in Fall 2004 for about $20 including shipping. It is in like new working and cosmetic condition with the manuals still in their shrink wrap. I acquired eight games and programs on E-bay for the TI-99/4a. I do not have a data recorder. The price sticker on the box states mine was originally bought at Sears for $149.99. My beige model, in good cosmetic and working condition, was purchased as one of a lot of 8 computers in December 2005. At a San Carlos area of San Diego garage sale on September 1, 2012 I purchased 12 software cartridges in their original packages and two TI joysticks for $4 total. The titles are: Home Financial Decisions, Parasec Arcade Entertainment, TI Invaders, Munch Man, Music Maker, Alpiner (with the original price sticker for $22.95 from Savon), TI Extended Basic, Touch Typing Tutor, Car Wars, Blackjack & Poker, Buck Rogers - Planet of Zoom, and Star Trek (with the original price sticker for $11.97 from KMart). All but the last two have a copyright date of 1981 are in in cardboard containers. The last two are in red and clear plastic containers and have a 1983 copyright date. Timex Sinclair 1000 (July 1982) a tiny computer priced just under $100! It has 2 kilobytes of RAM and hooks up to a television. It has a very small membrane keyboard making typing difficult. Its main selling point was that it was less than $100 and it sold well - over 1/2 million computers in the first six months. 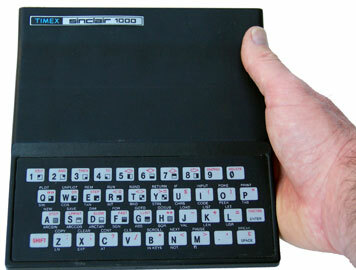 The Timex Sinclair 1000 was the North American version of the British Sinclair ZX-81. Excellent information is contained at Obsolete Technology. Mine was purchased on eBay in December 2005 as part of a lot of eight computers. 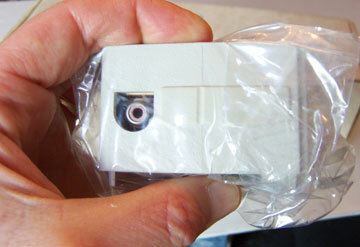 It is in excellent cosmetic condition with the box and support material. Mine strangely has two power supplies which are hooked together. I have not been able to get it to work yet, but I may be doing something wrong. There is not a lot you could do with it anyway except write basic programs which is much easier to do on a computer with a regular size keyboard. Large Image - Memory Console with Game Port Coleco Adam (October 1983 - January 1985) Coleco, an America toy company which gave birth to the mass production of the wildly successful Cabbage Patch Kids in 1982, had another great idea in 1983 - a whole computer system including a letter quality daisy wheel printer for about $600. (Oldcomputers.net gives the price as $600. Coleco Adam - Wikipedia states the price was $525 at the initial announcement of the computer in June 1983 but the price upon shipment in October 1983 was $725.) Daisy wheel printers at the time were at least that much. The computer also had respectable specifications for 1983 including a Z-80 processor with 80kb of RAM (64kb usable). 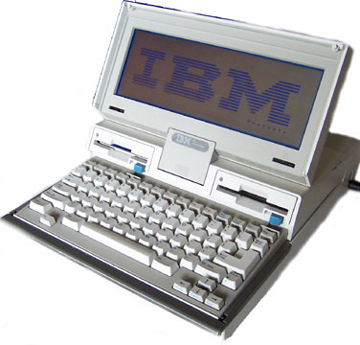 It could even run the CP/M operating system which had been the standard for business computers until the IBM PC. It had a built in word processing program. It also could run all of the existing ColecoVision games. While it did not come with a floppy drive it did have a high speed cassette tape storage system with a capacity of 256kb which was more than many floppy drives at the time. A floppy drive is, of course, much more convenient and an optional floppy drive was available. 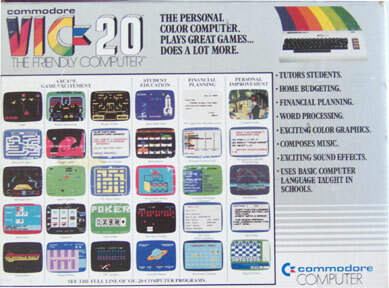 The computer supported color graphics. The user supplied a television to use a the monitor. While it appeared to have everything a family would want including word processing and games, the Adam system was unsuccessful and partially the cause of Coleco's Chapter 11 reorganization bankruptcy in 1988. (See a href="http://en.wikipedia.org/wiki/Coleco">Coleco - Wikipedia.) After the initial shipment in October 1983 further shipments were stopped until early 1984 because of printer problems and data cassette issues. (See Oldcomputers.net, Coleco Adam - Wikipedia, and Dave's Old Computers.) The computer stopped shipping in January 1985. The computer had several quirks. You could not turn the computer on or off with a data pack in it. This risked destroying the tape and/or breaking the drive. You could also not keep the tapes near the printer. That might destroy the data. The power supply was in the printer. You could therefore not use the computer without the printer. (See old-computers.com) The printer was apparently very noisy, but that was true of all daisy wheel printers. (See myoldcomputers.com, www.codinghorror.com.) Daisy wheel printers sounded like a machine gun. That was the only way at the time to get letter quality printing, however. I remember reading about the Adam in 1983 and seriously considered getting one to type a master's thesis on. I luckily decided not to, however. I was mainly concerned with the inconvenience of using a cassette tape system as well as the readability of a television monitor. It would have also been disastrous to set a tape on the printer and have my writing disappear. I instead rented a Kaypro 4 in early 1984. The Coleco Adam Technical Manual is at drushel.cwru.edu. The Adam still has quite a following. See, e.g., www.adamcon.org, Coleco ADAM. The setup manual and dozens of other manuals are available at theadamresource.com, simply an amazing compilation of information about a nearly 30 year old computer system that was sold for about a year! I purchased my Coleco Adam system on October 5, 2012 in Poway, CA from a Craigslist ad. I actually got three systems. Two of the consoles do not have a game port. This type of console is called the Memory Console 3. You could purchase a less expensive system with this console if you already had a ColecoVision game console. (See www.digibarn.com.) The third console is the standard with the game port. The cassette device for this one was loose. I have three keyboards. I only have two printers, however. One of the printers has a key lock installed by a prior owner to turn it on and off. I have one SmartBasic cassette. I have not yet tried any of the machines. I purchased the machines as a lot of several computers which also included an Apple IIe Platinum with two floppy drives, a Monitor III and two file boxes full of educational software, a Kaypro II without software, a Commodore 64C with a 1541 floppy drive and color Commodore model 1701 monitor, two Commodore Amiga 1000 computers, one Commodore Amiga 500 computer, two Amiga keyboards, one Amiga monitor and an older Magnavox monitor. The total price was $120. The seller had been an avid collector of ColecoVision games. He said he sold his very complete collection of ColecoVision games recently for an astonishing $17,000!